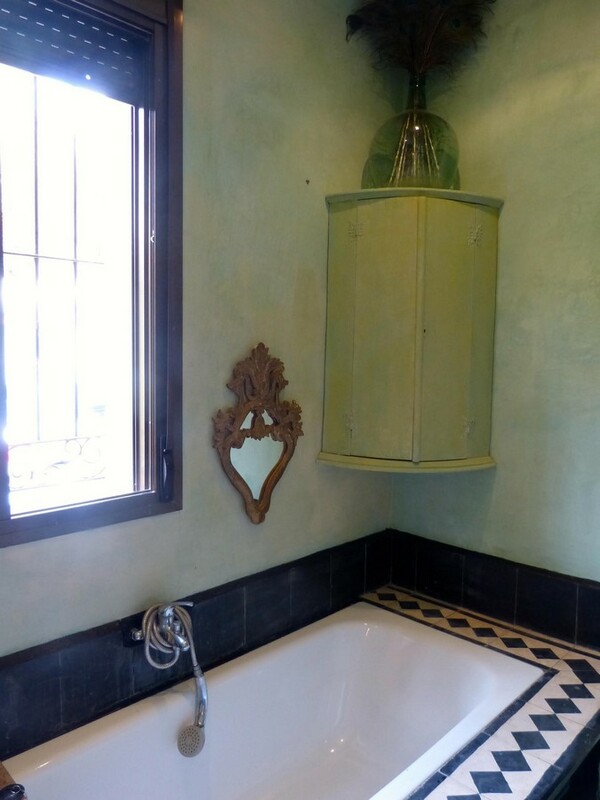 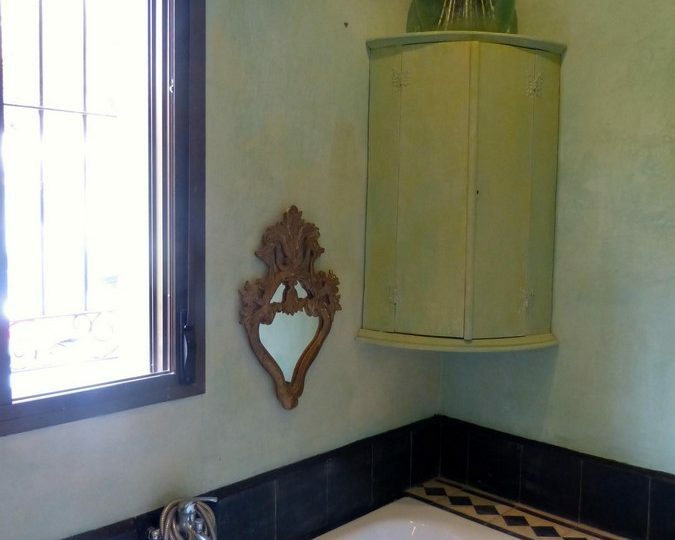 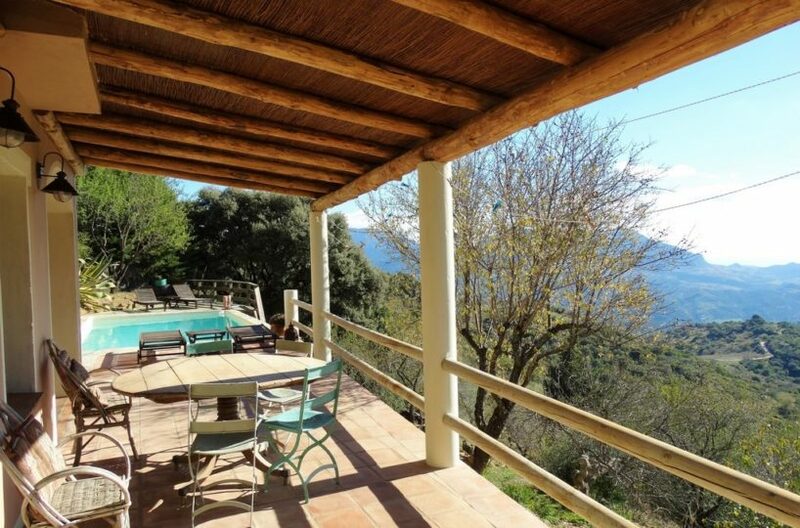 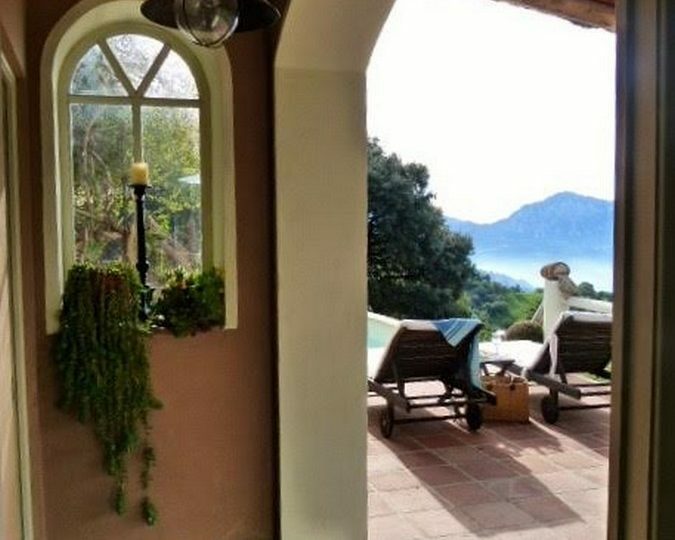 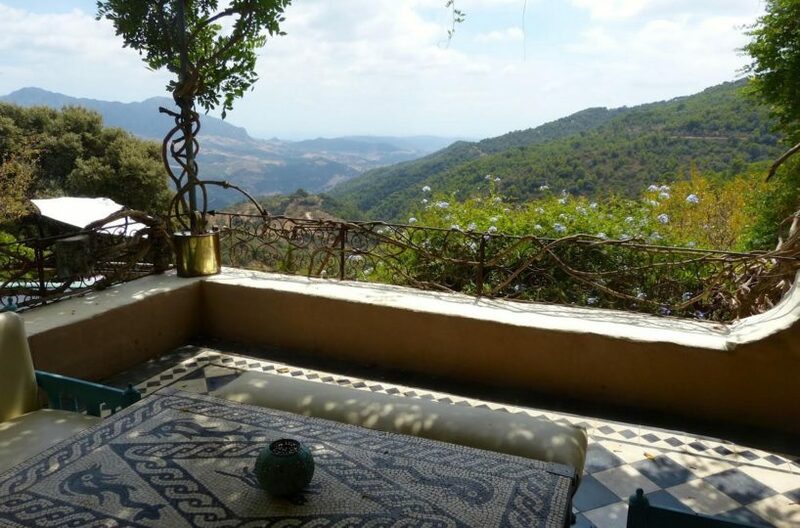 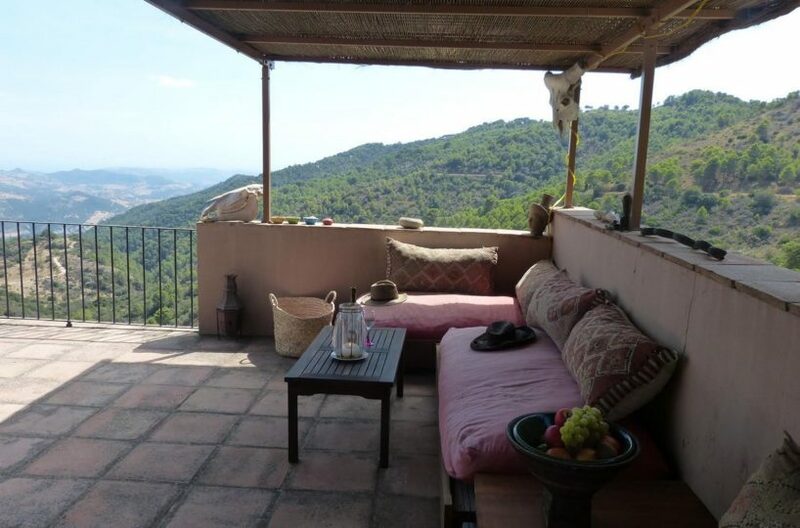 Beautiful and unique Property in Gaucin for sale. 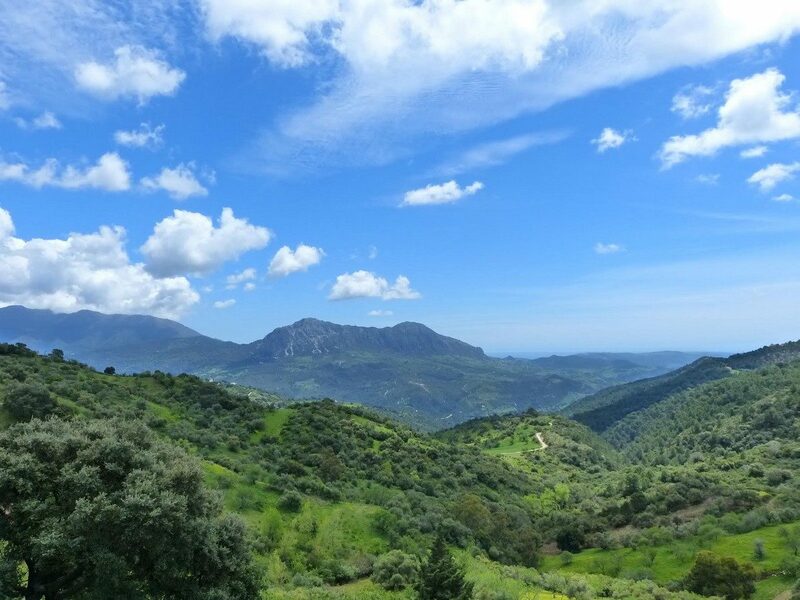 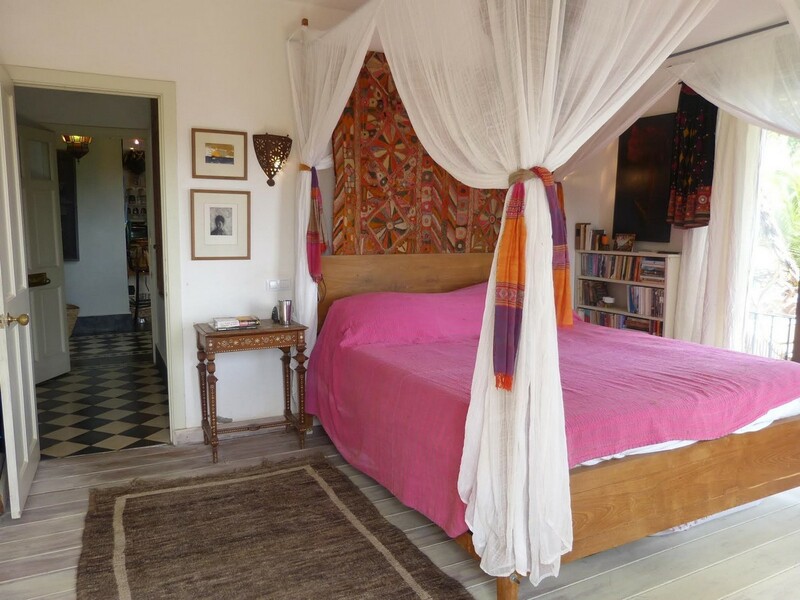 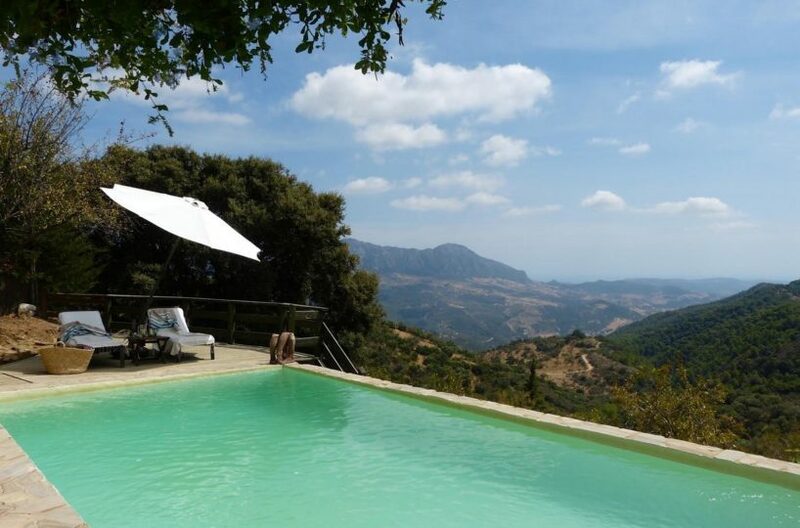 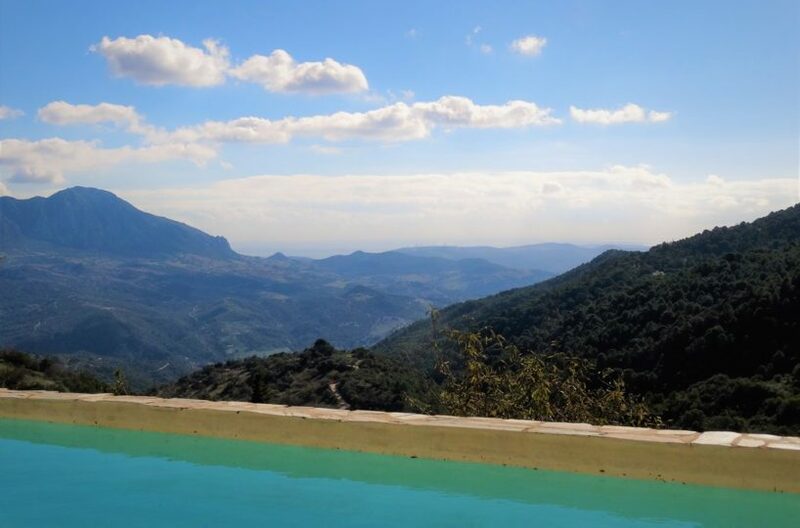 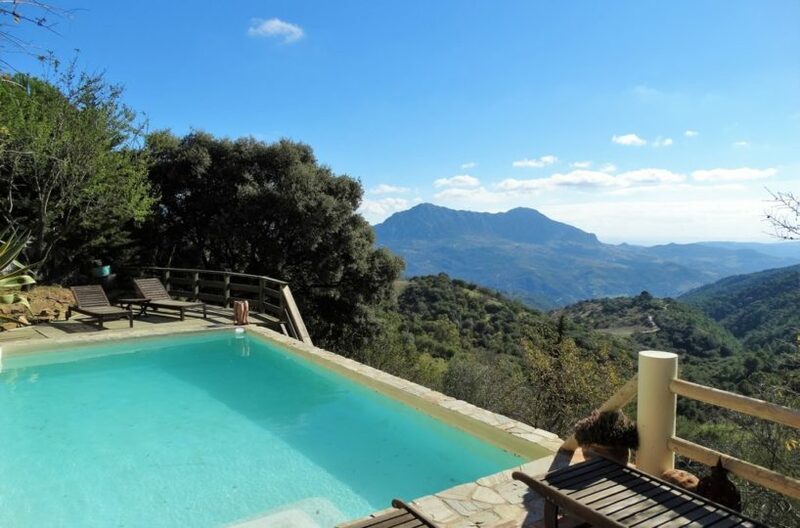 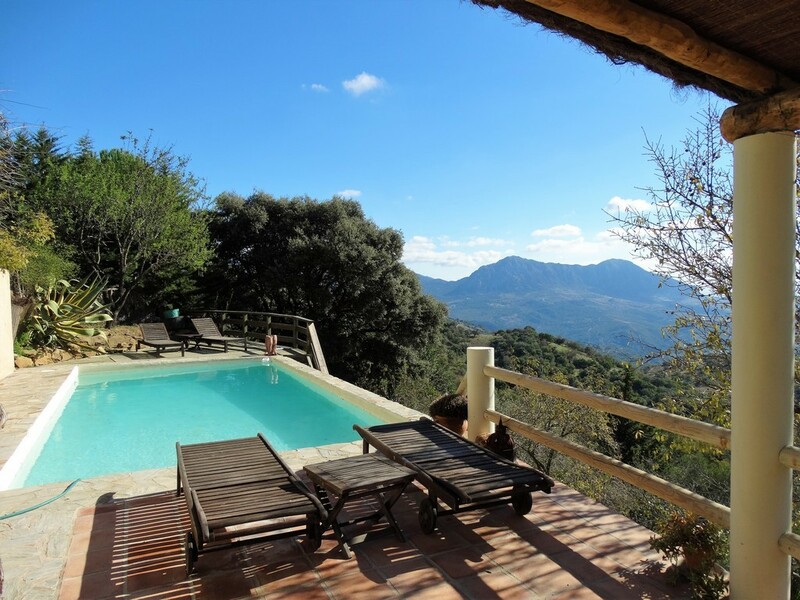 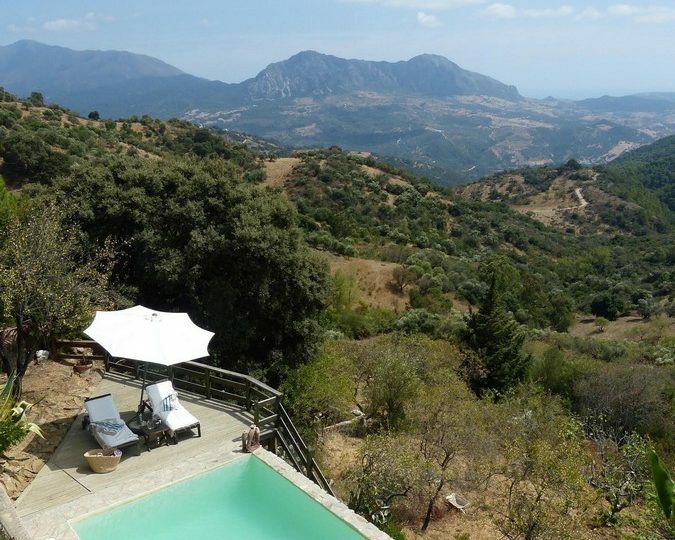 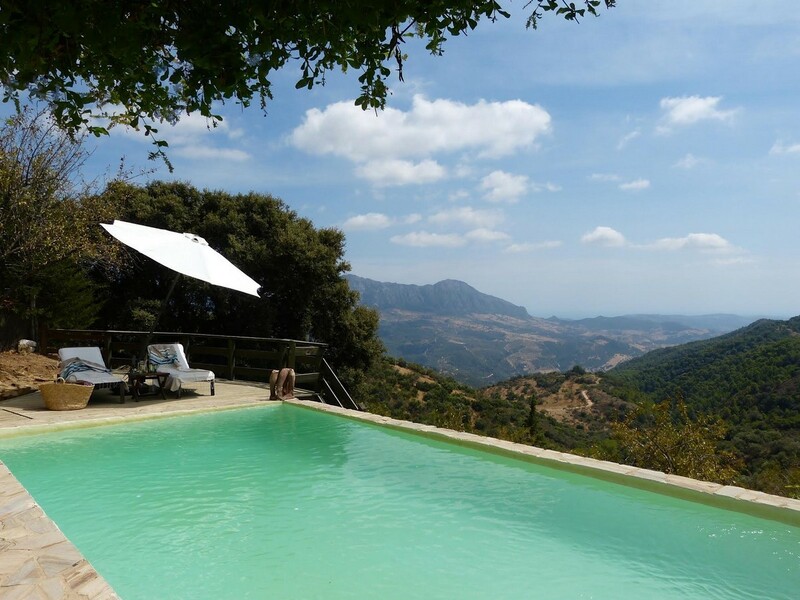 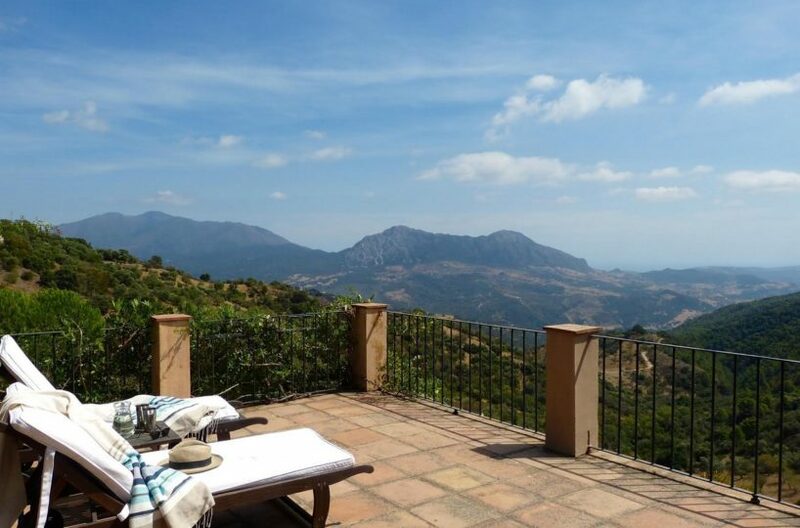 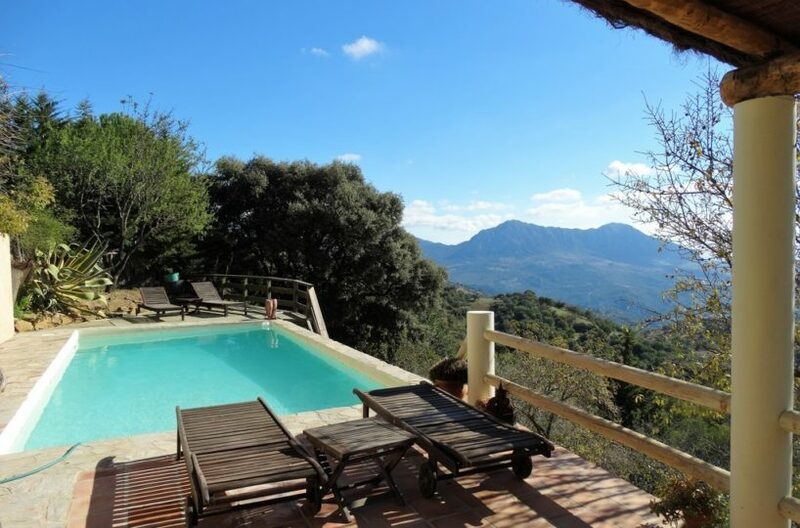 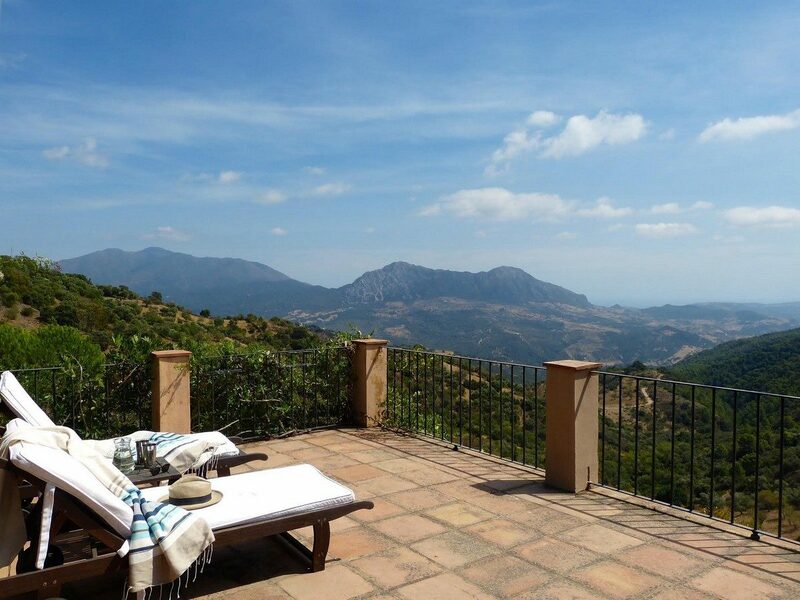 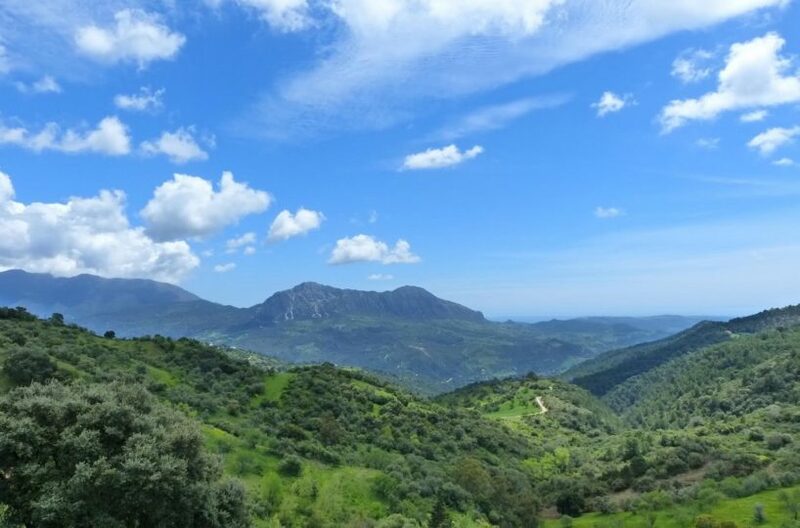 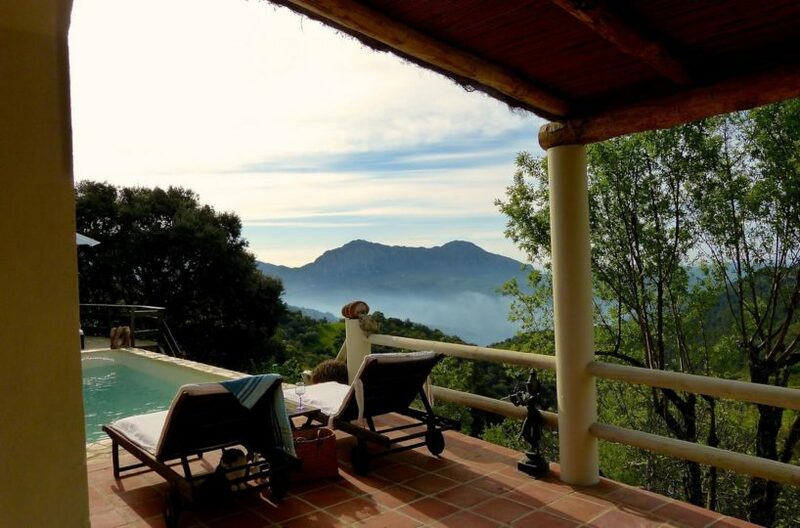 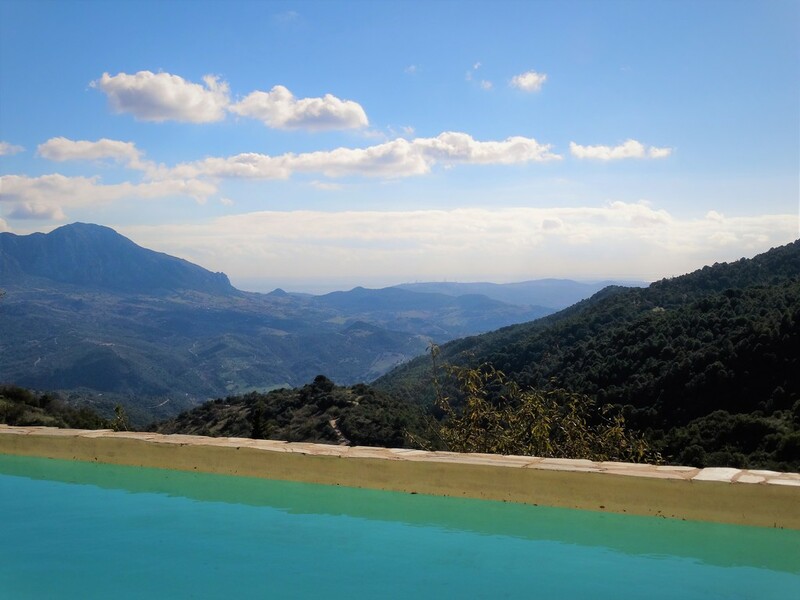 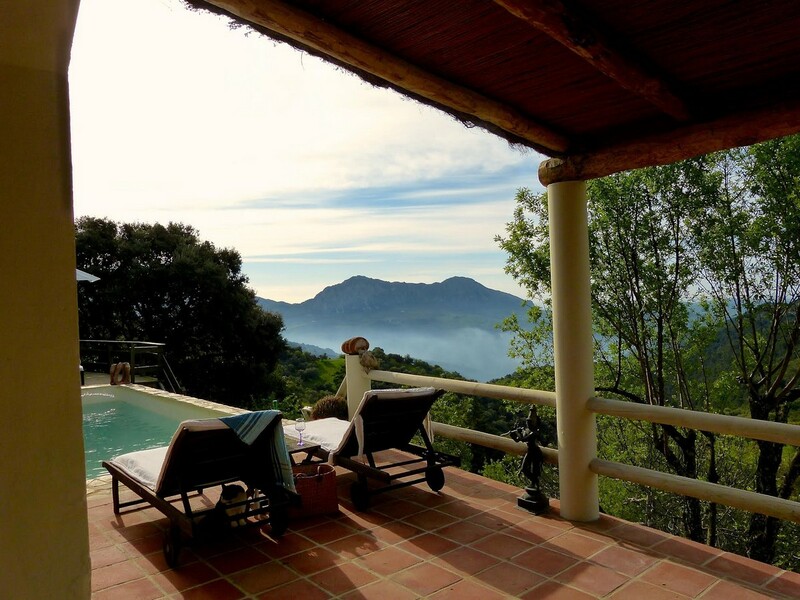 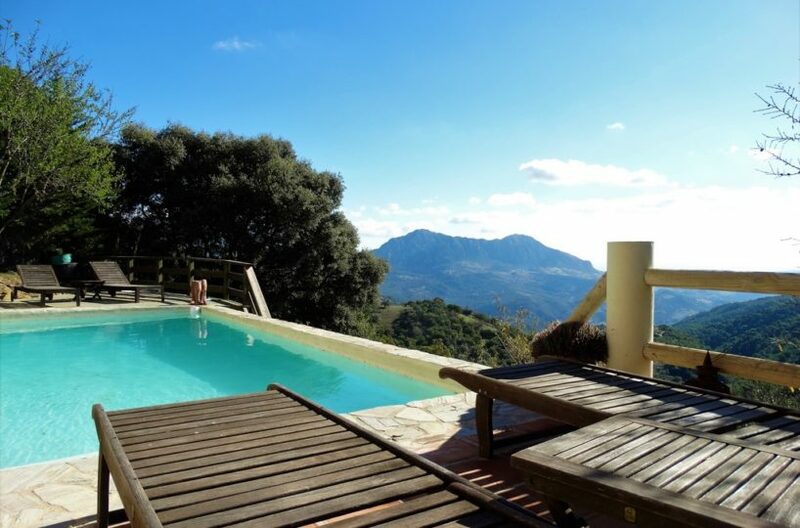 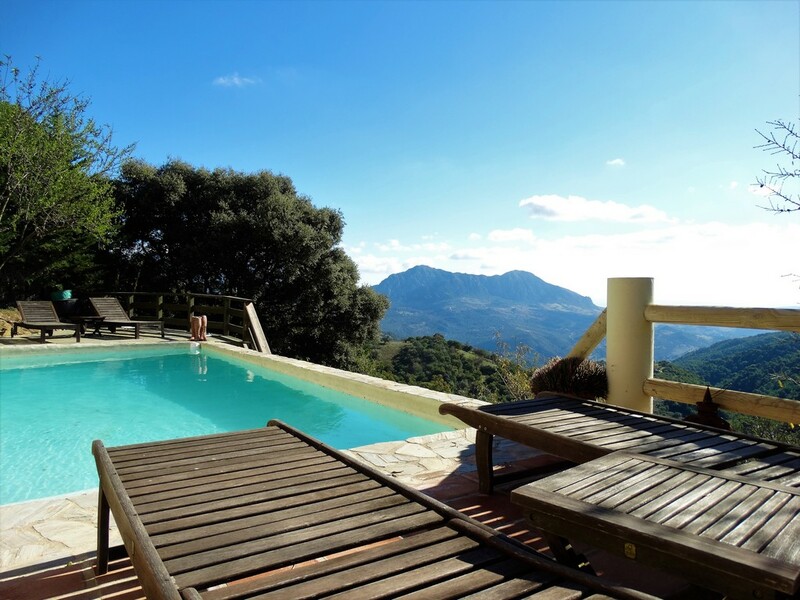 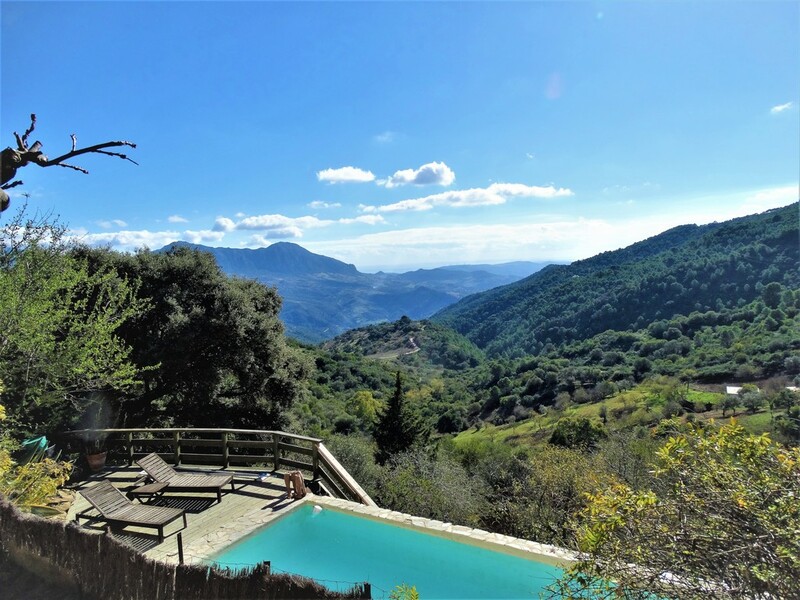 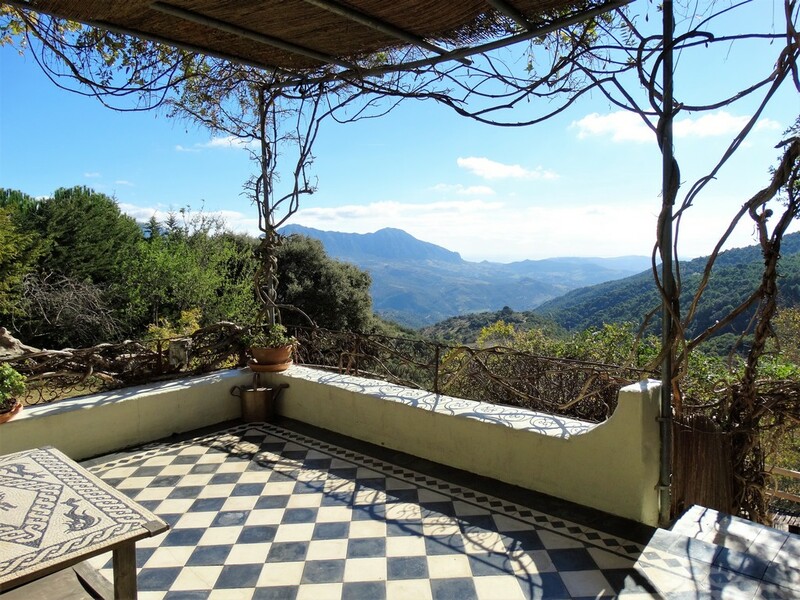 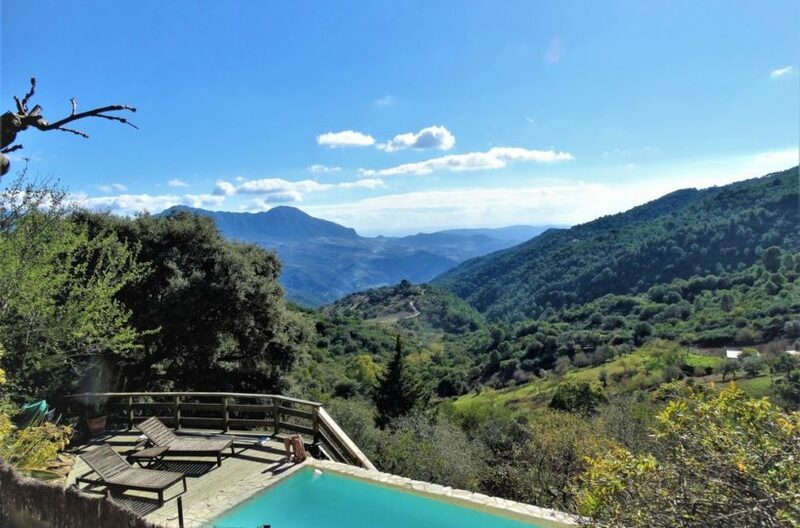 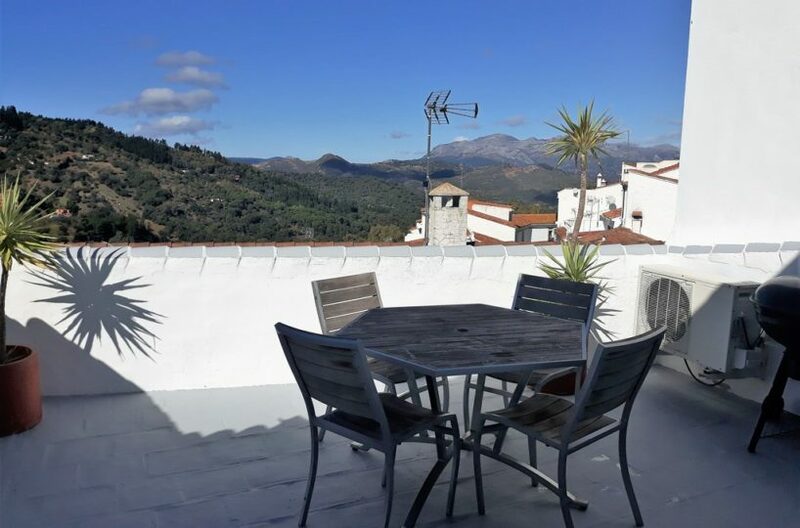 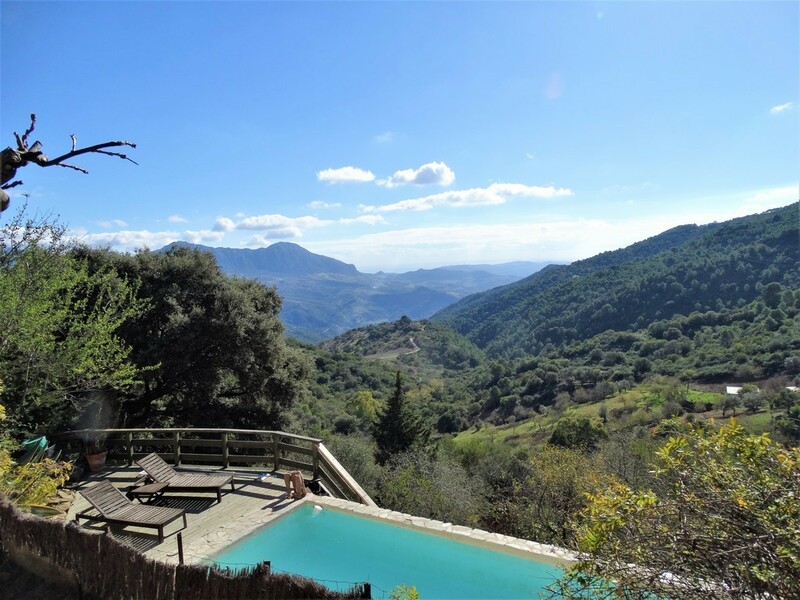 The property is just a few km from Gaucin Village, in a very private location facing south for unbeatable views of the Genal valley, the coast of Spain and Africa beyond. 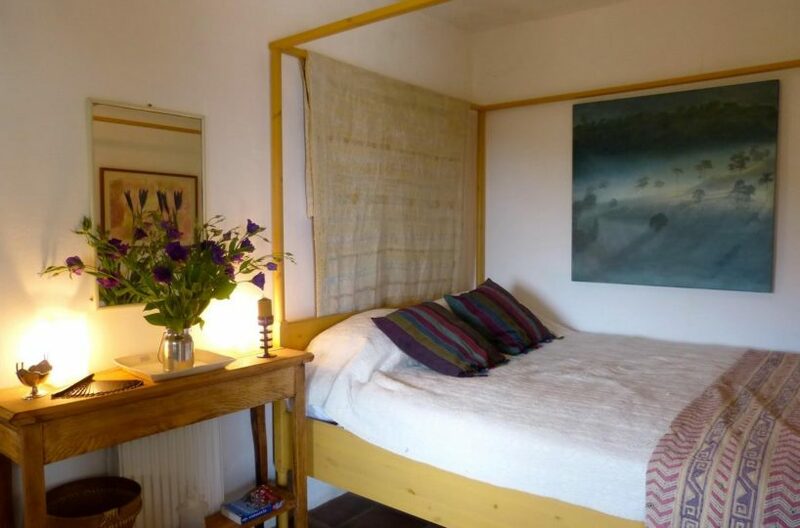 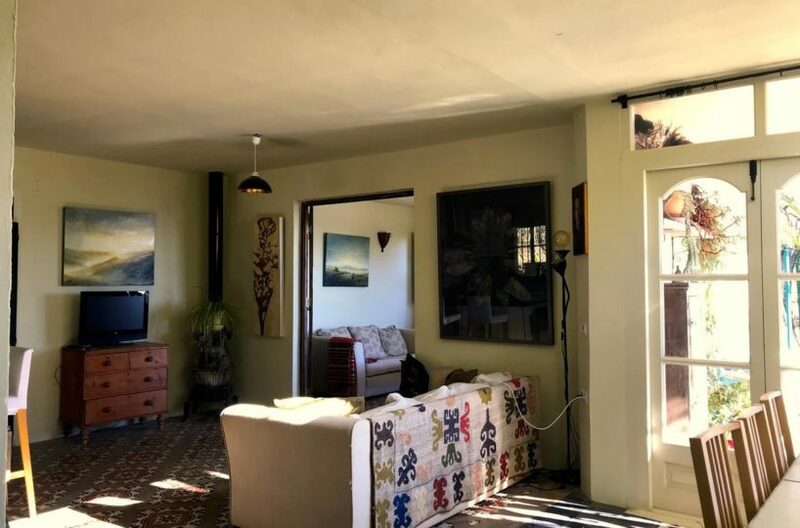 The house was designed by an artist and is disposed to take advantage of the light and surrounding countryside with lovely details, resulting in a warm and comfortable home. 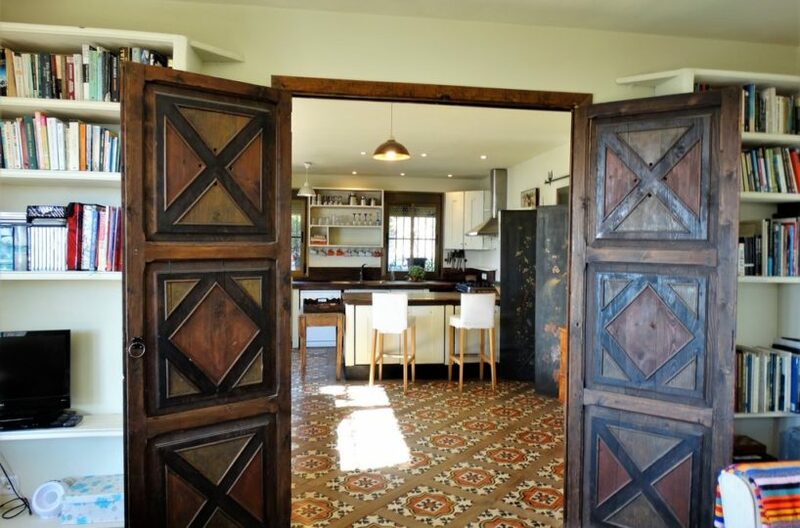 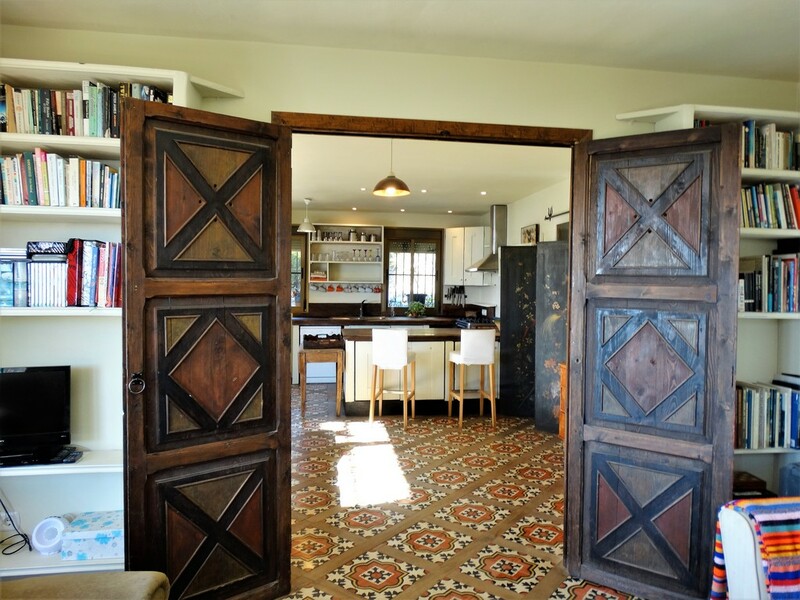 The main entrance takes you to a large open plan room and bespoke kitchen with painted wooden doors and hydraulic floor tiles imported from Morocco and a breakfast bar. 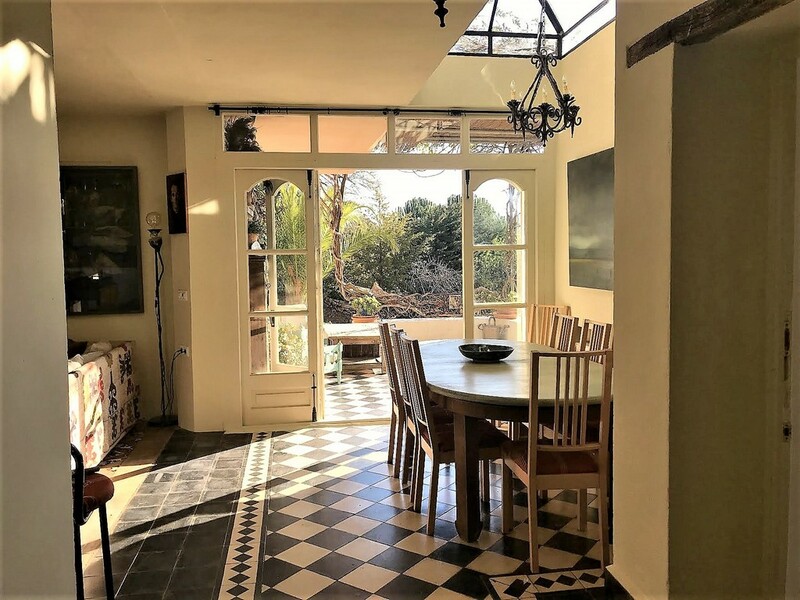 The dining/living area has a large skylight in the ceiling above and french doors leading out onto the covered terrace. 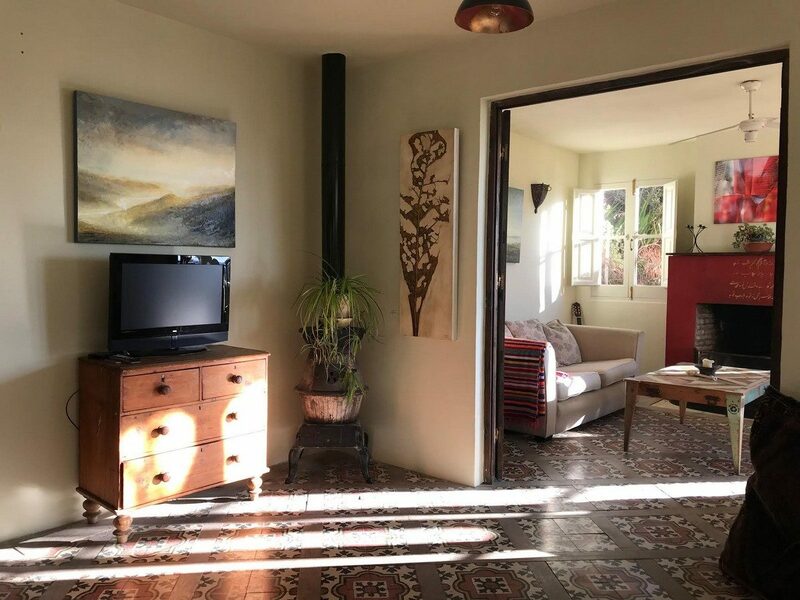 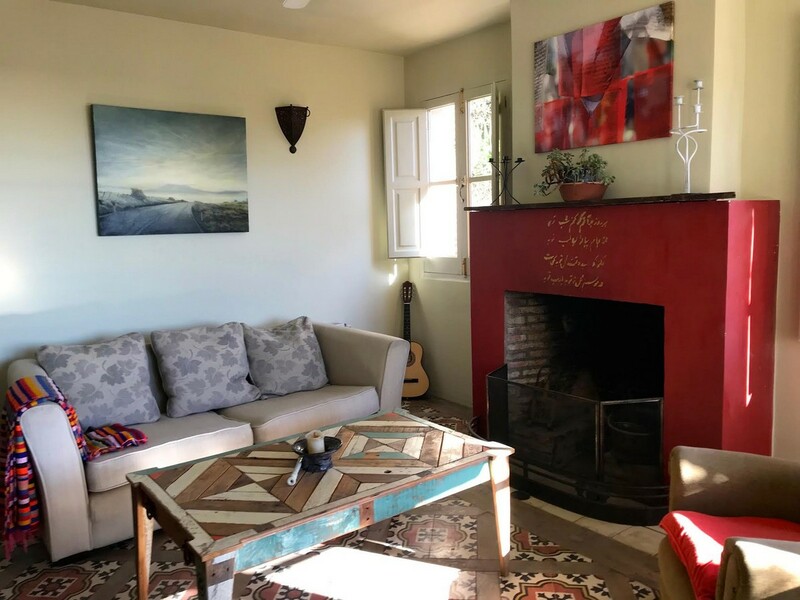 There is a wood burning stove in the corner and the living room off this has an open fire place and french doors leading out onto the terrace and the wonderful views. 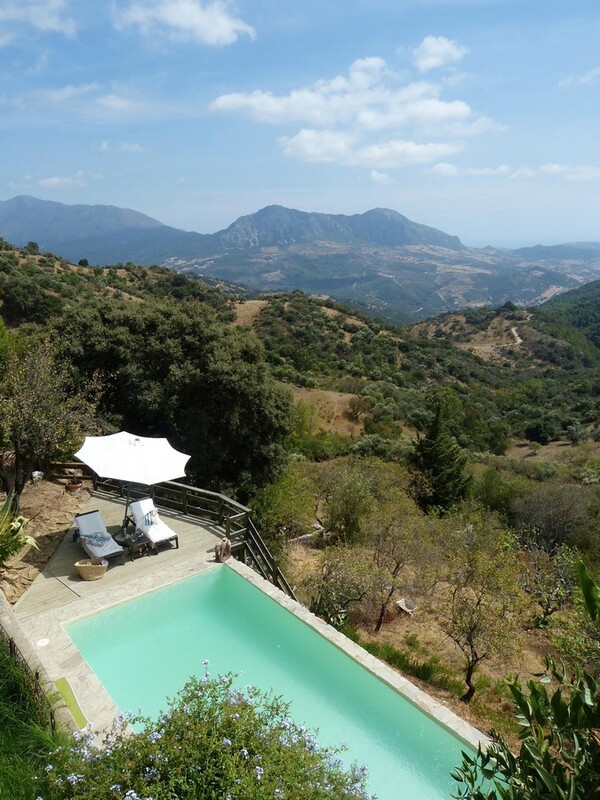 This in turn leads onto a lawned garden area and looks over the large infinity style pool. 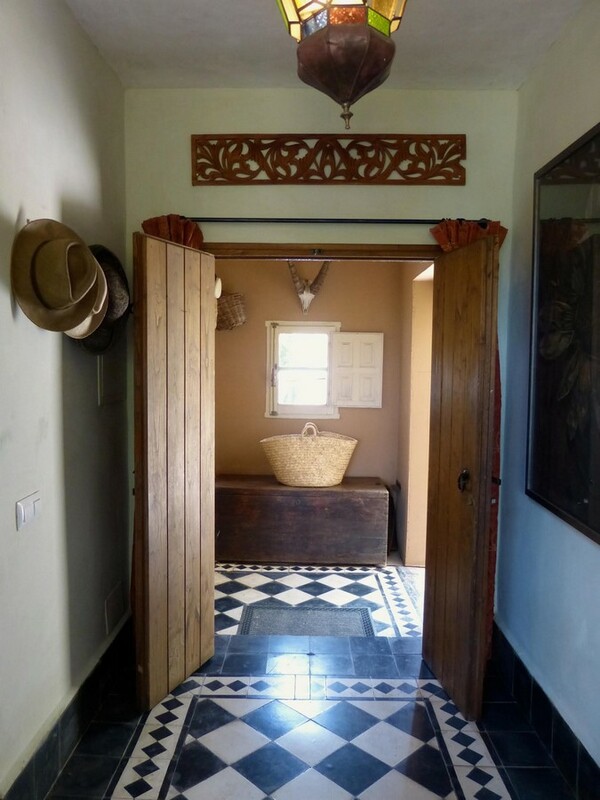 On the same floor there is a hallway leading to two large bedrooms and a large bathroom. 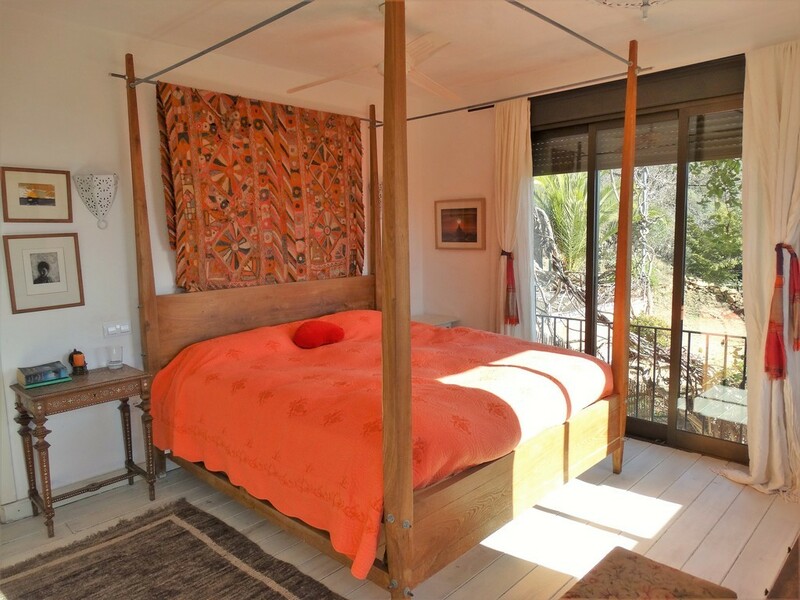 The master bedroom is on the corner of the house and large windows to appreciate the views all the way to Africa. 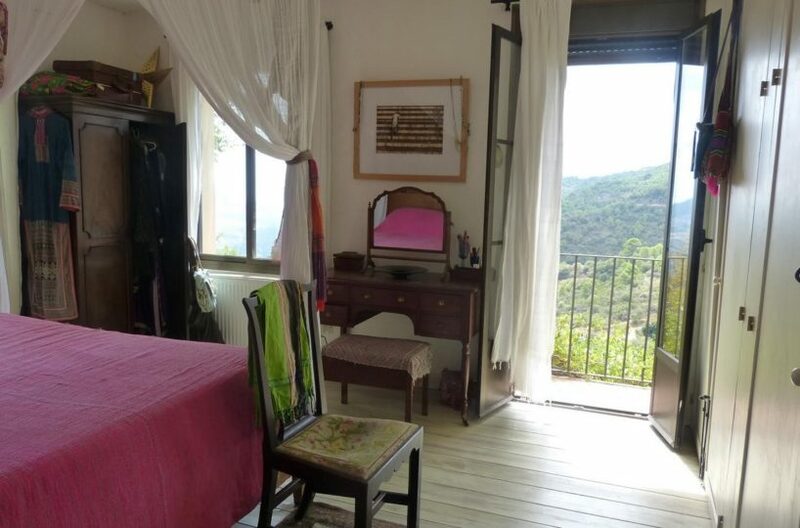 The smaller room also takes advantage of the views and both are light and airy. 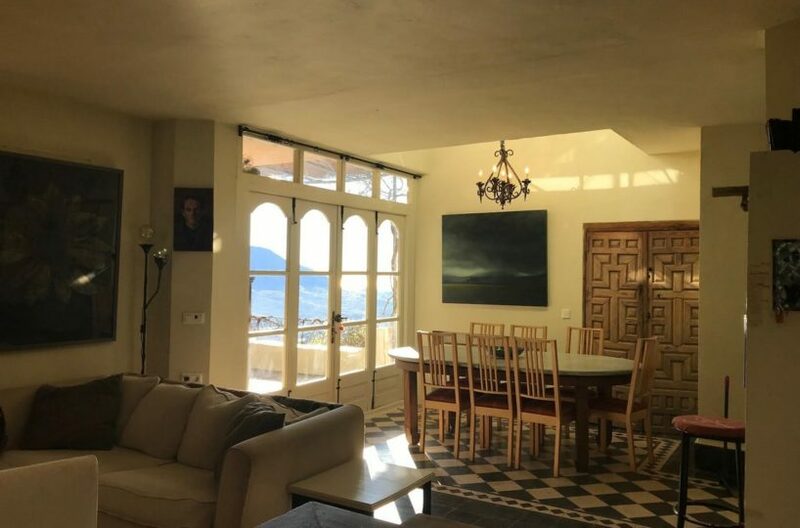 The floor above the main living area of the house is accessed both from the terrace and also its own access from the track to the back of the property. 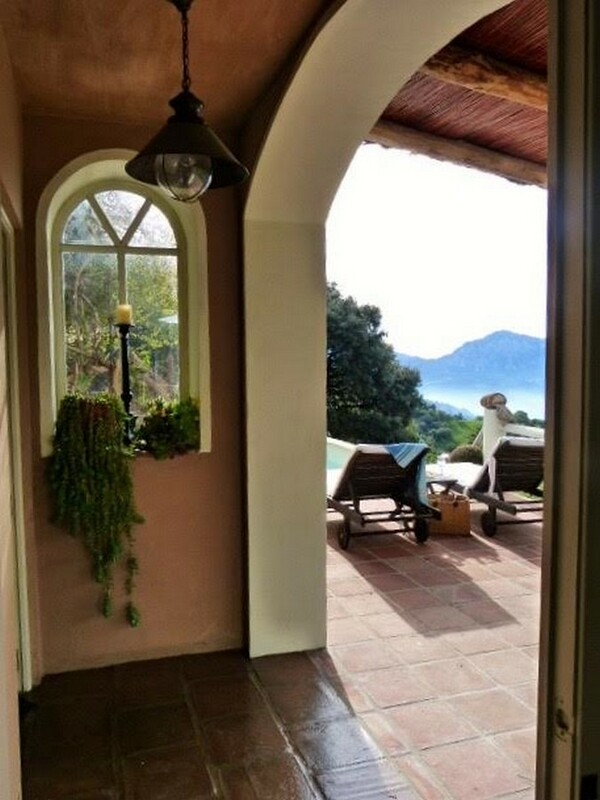 The stairs from the terrace lead onto another large terrace with a shaded sitting area and 180 degree views including the Crestallina mountains and the straits of Gibraltar. 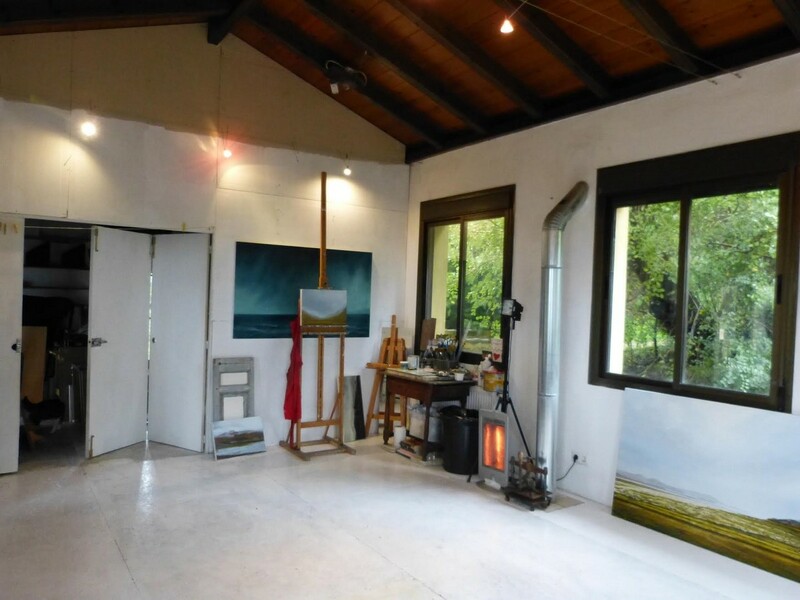 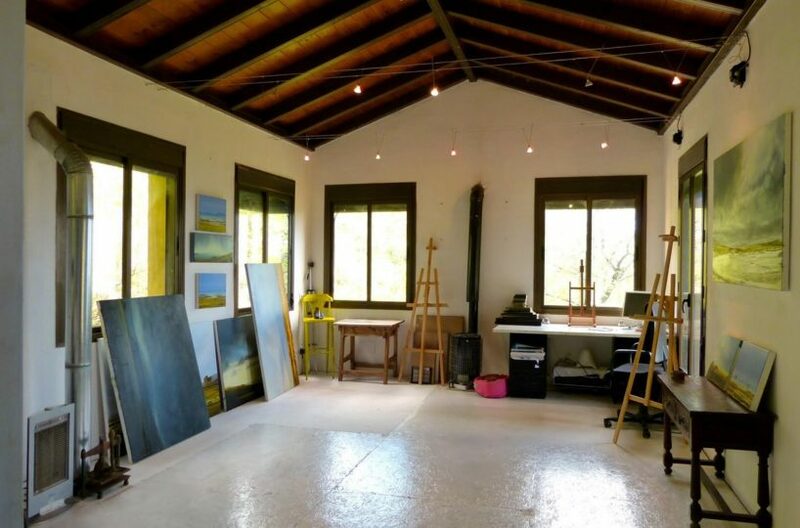 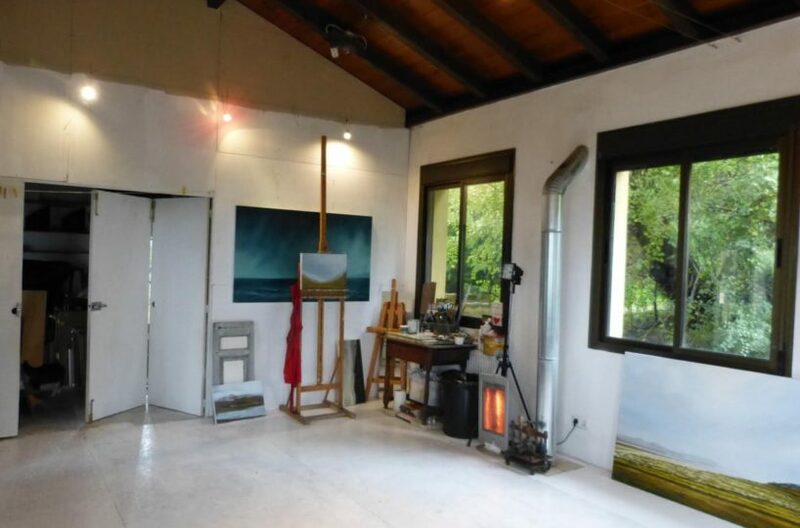 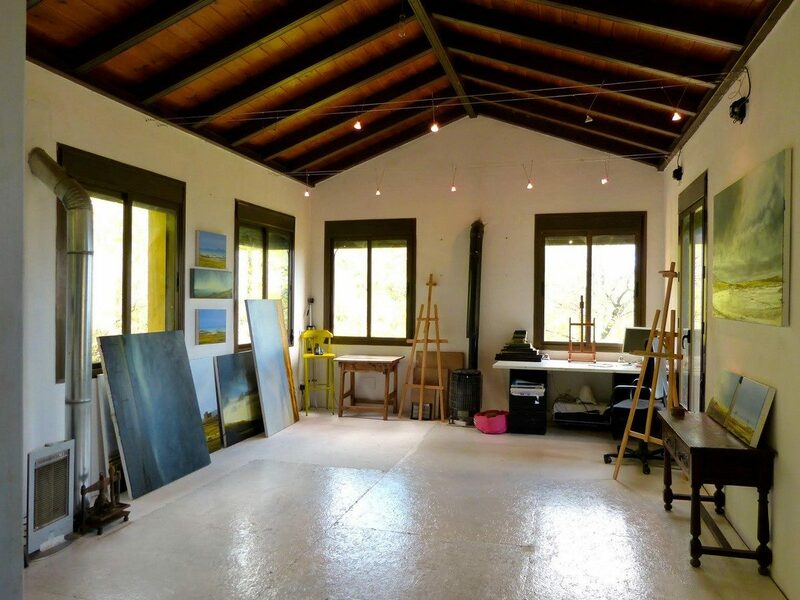 To the back of the terrace is a large open plan room, currently the artist’s studio with plenty of windows and light with incredible views. 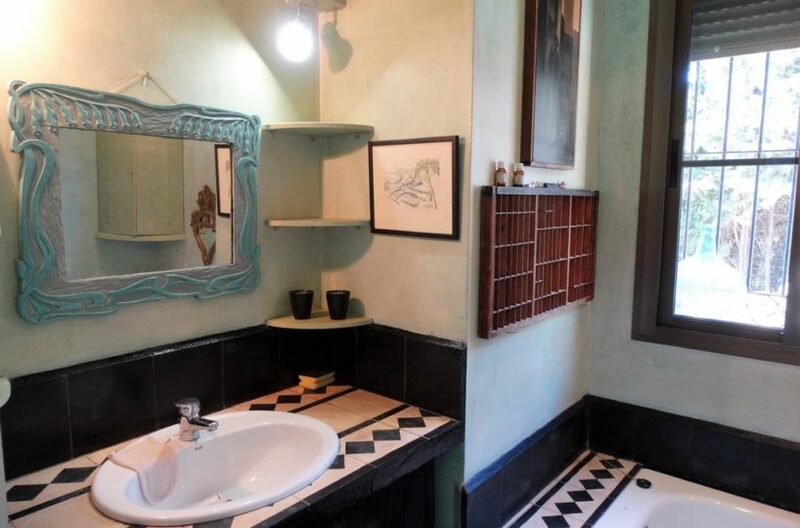 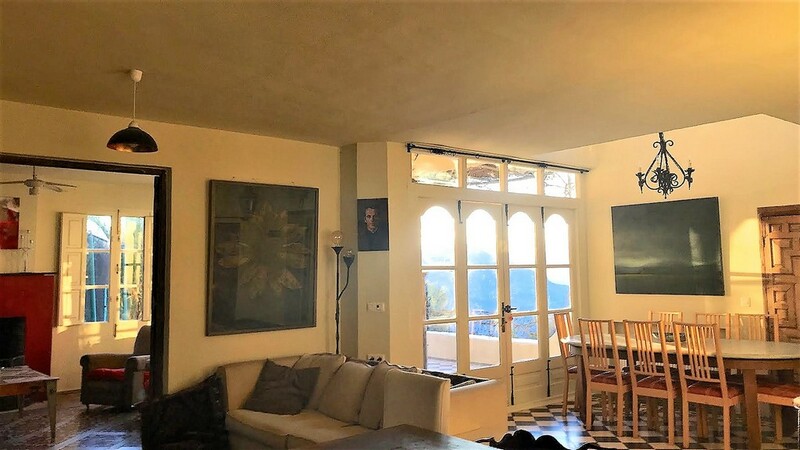 This could be converted to a further two bedrooms and bathroom and since it has its own access could easily be converted into a fully independent apartment as a rental unit. 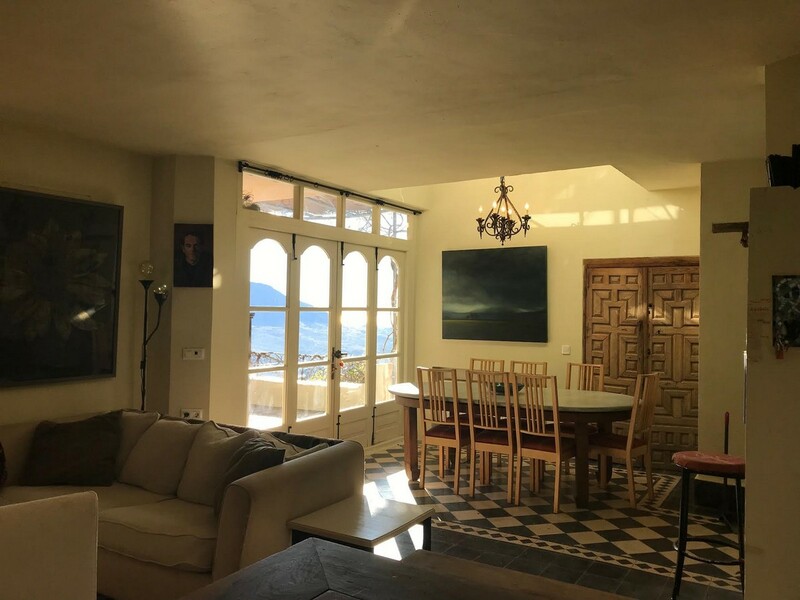 The terrace on the ground floor also leads onto the bottom terrace down a flight of stairs and the large swimming pool built to take full advantage of the property’s priviledged position. 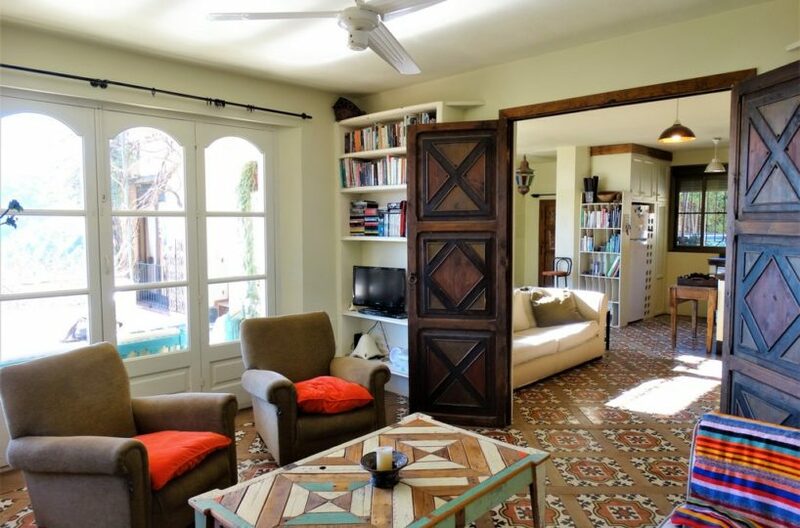 There is plenty of space to sunbathe and has a large covered porch area leading onto two further bedrooms and another bathroom. 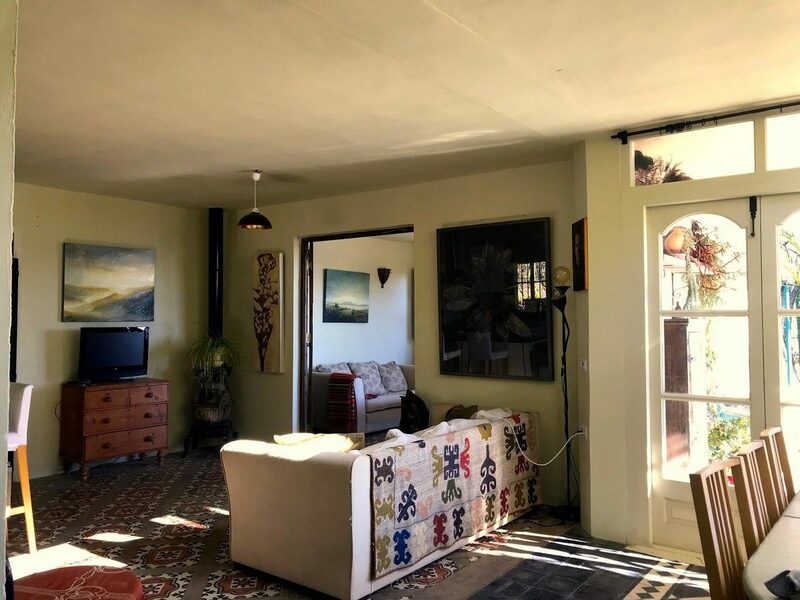 This lower level is also accessed from a patio area to the side of the property and could easily be converted into a separate apartment if desired. 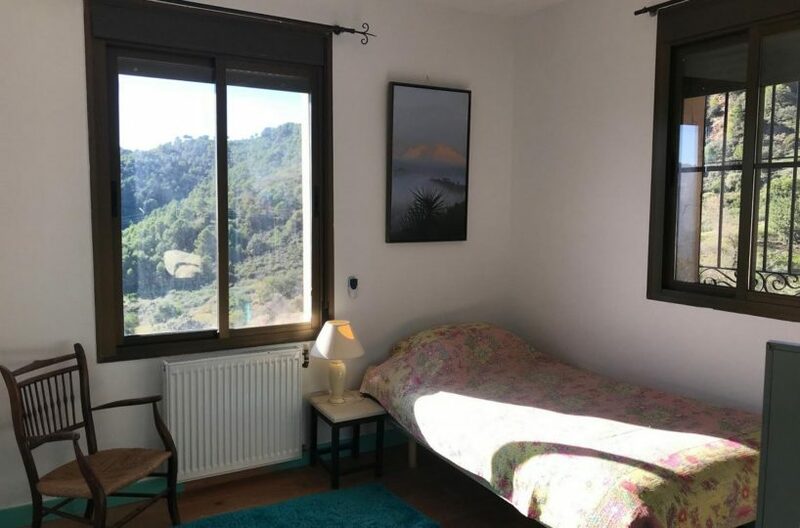 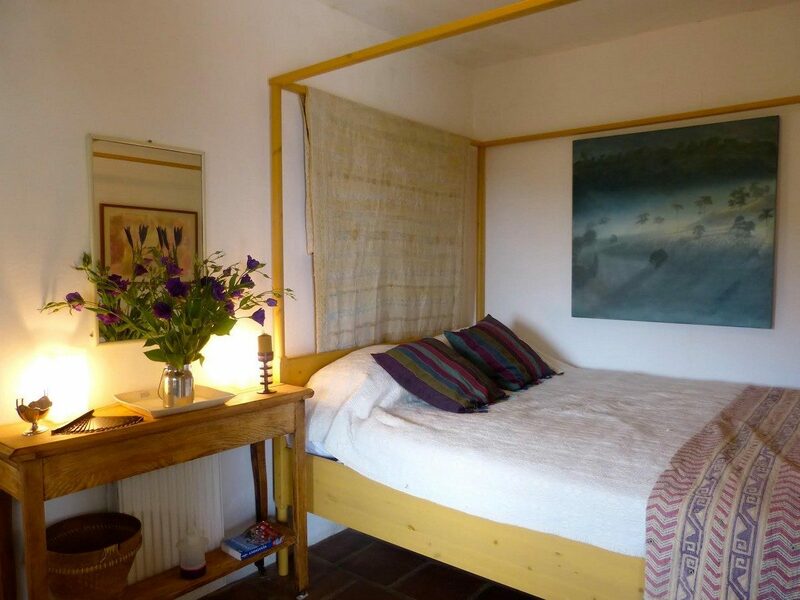 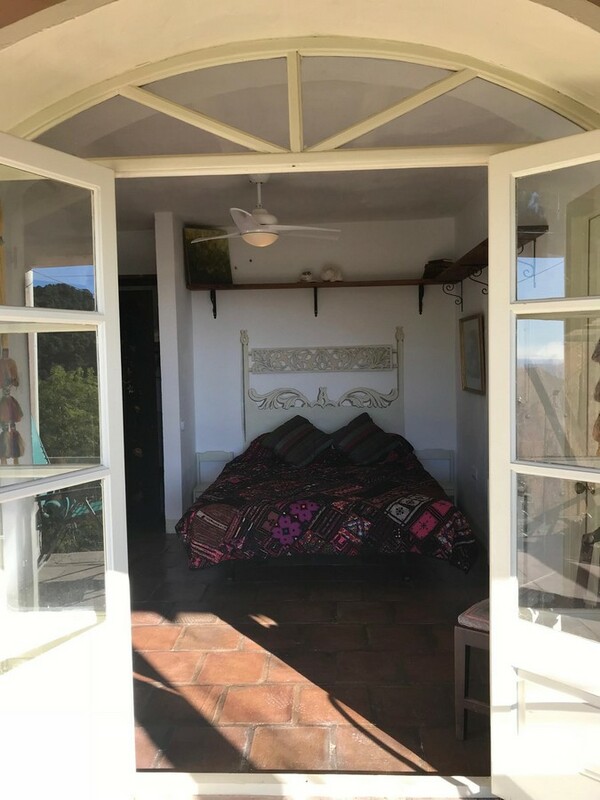 At the bottom of the land there is a large flat area and a stone built casita and terrace with a small kitchen and plumbing for a bathroom, which could become further guest accomodation, totally separate from the main house and very private. 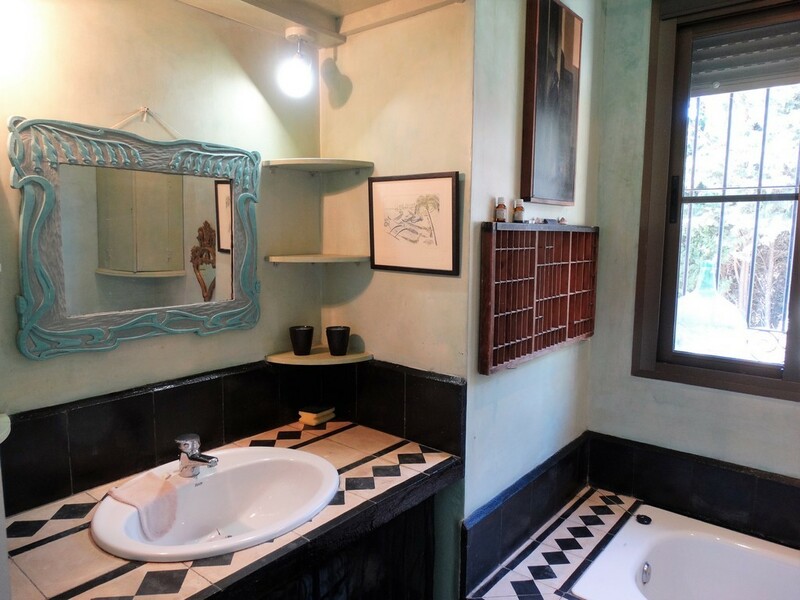 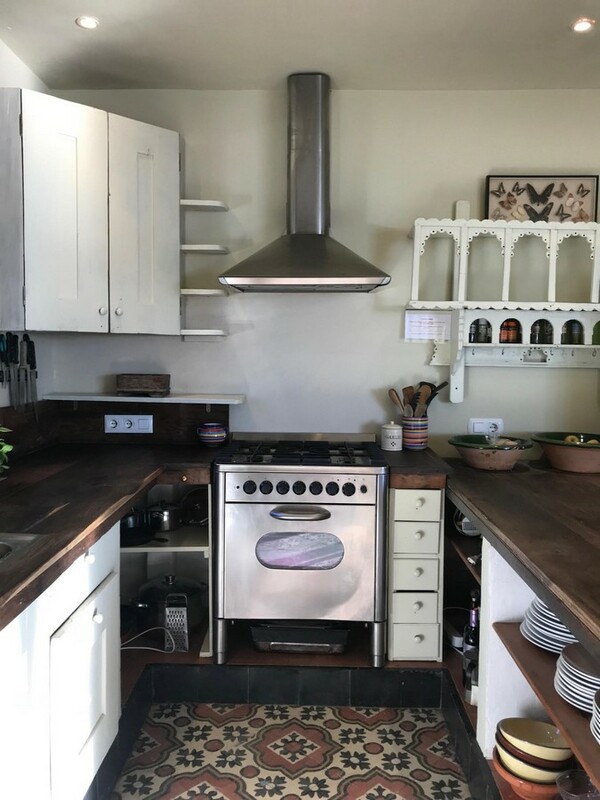 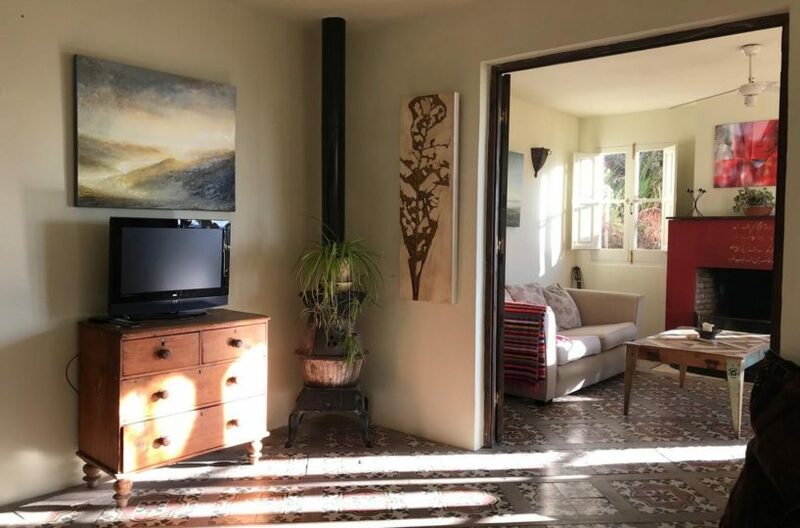 The property has mains water and mains electricity, There is a large water deposit under the building to collect rain water for use in the garden and pool. 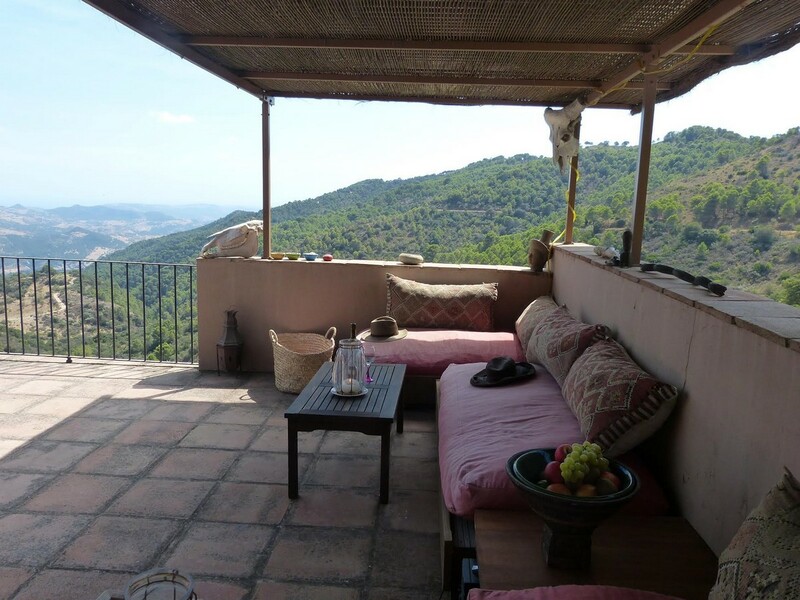 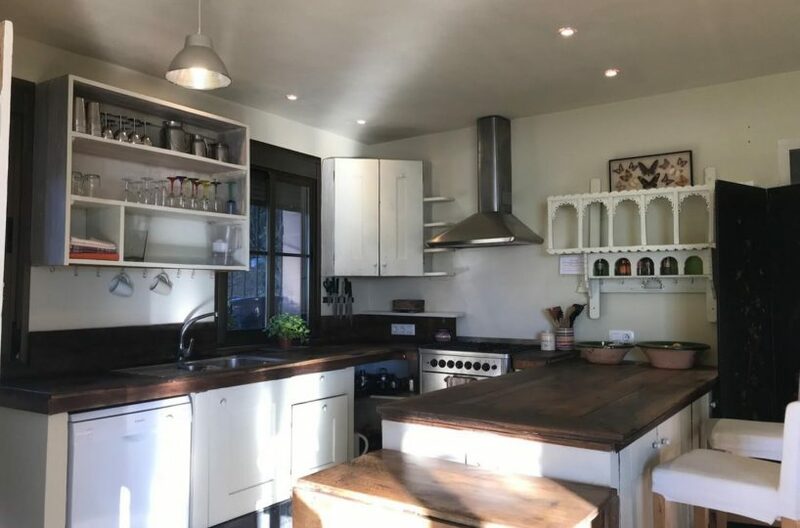 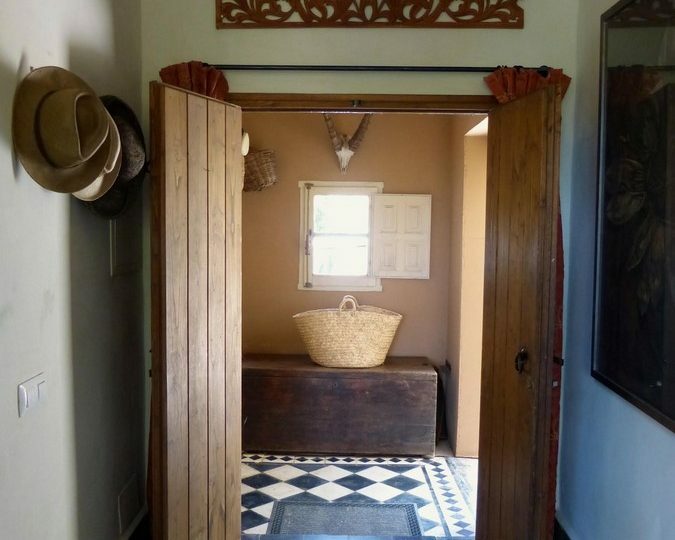 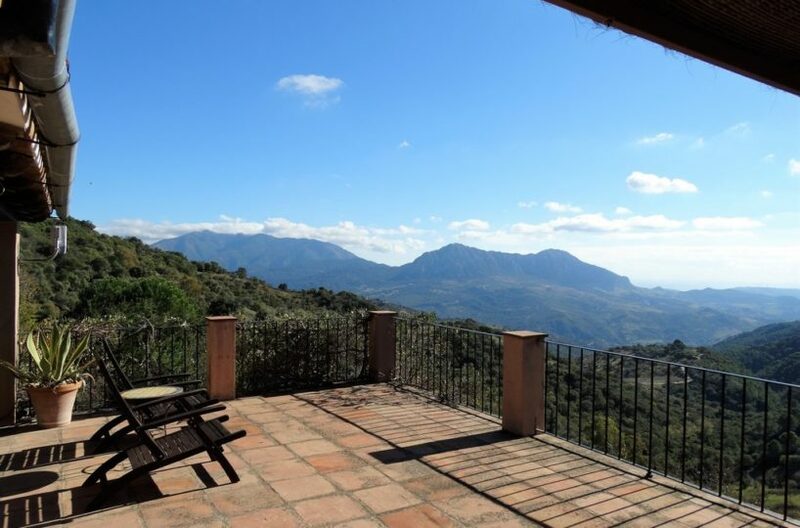 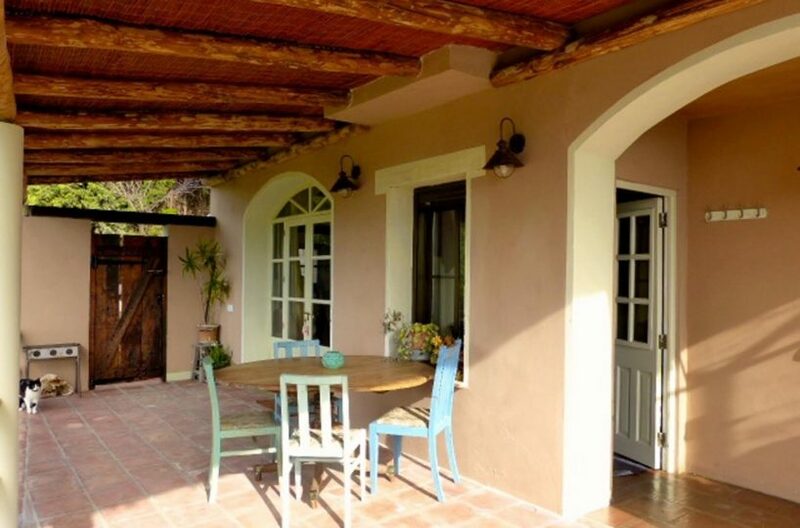 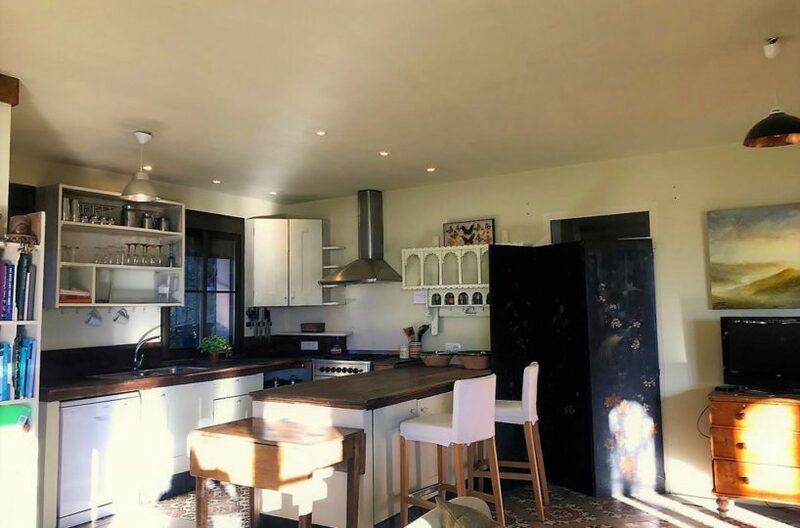 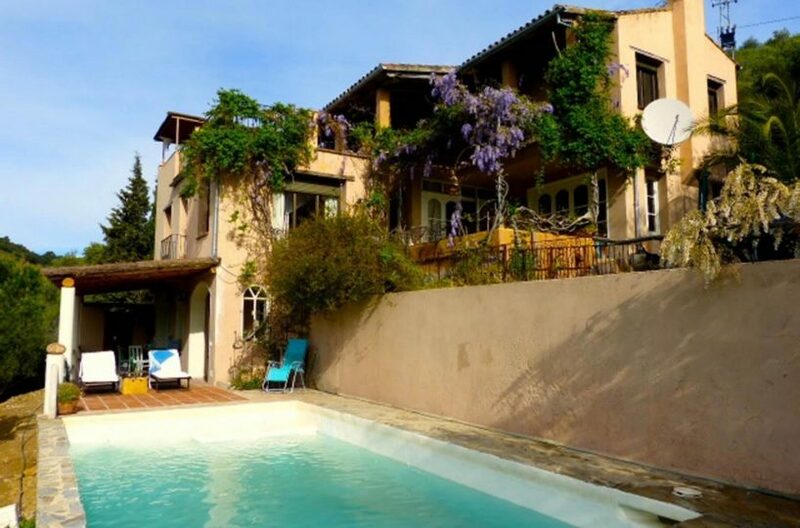 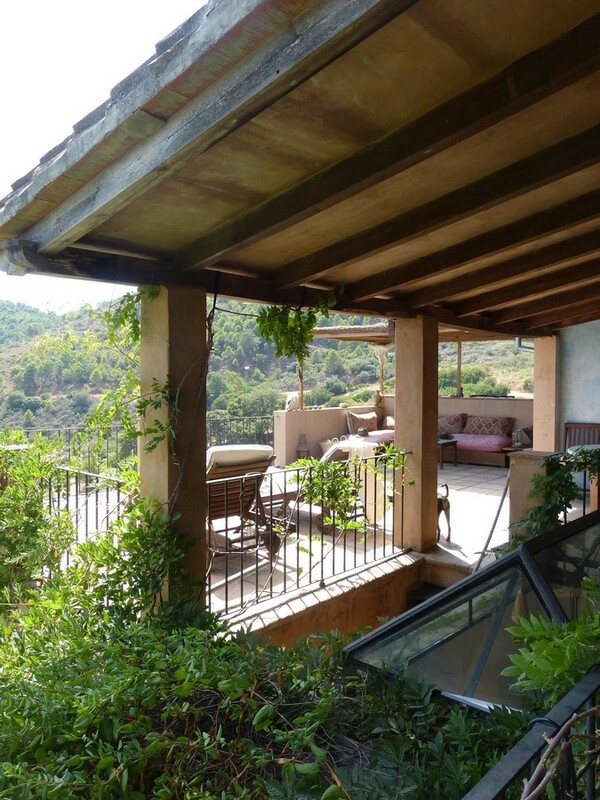 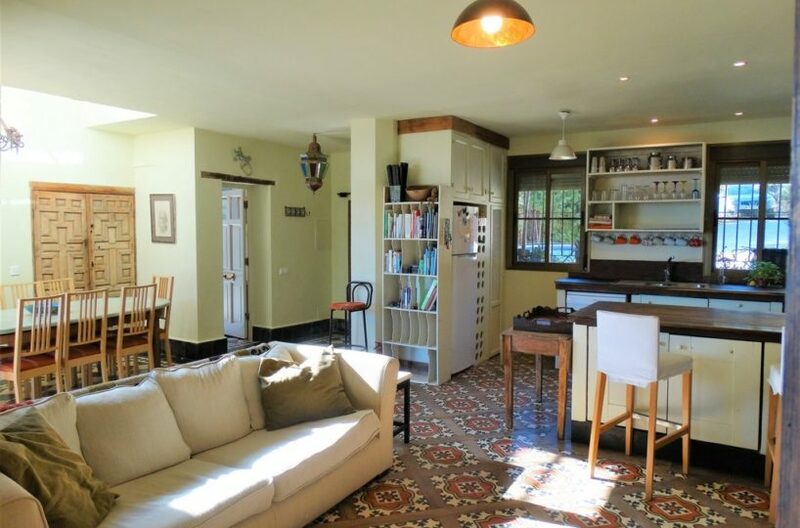 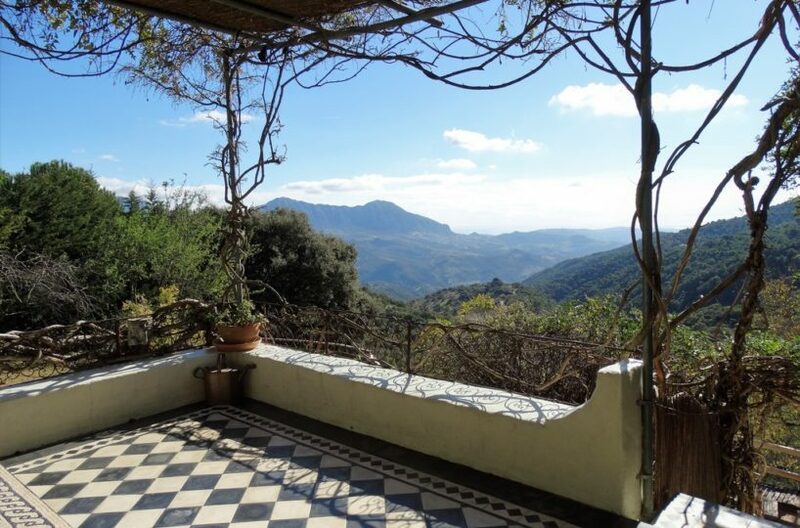 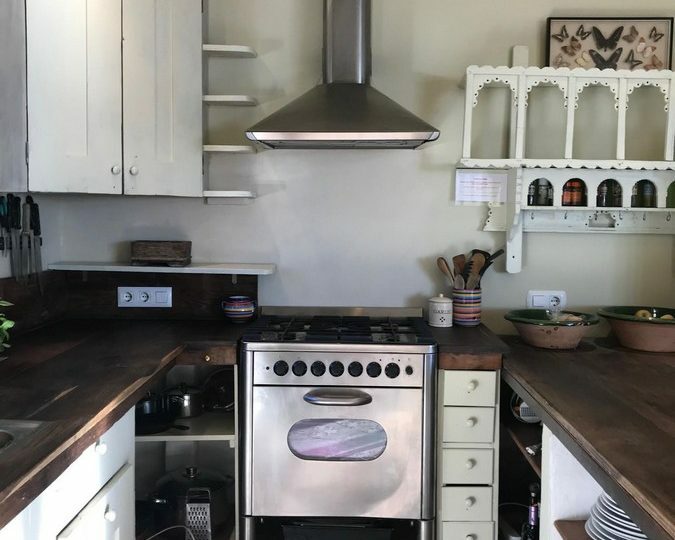 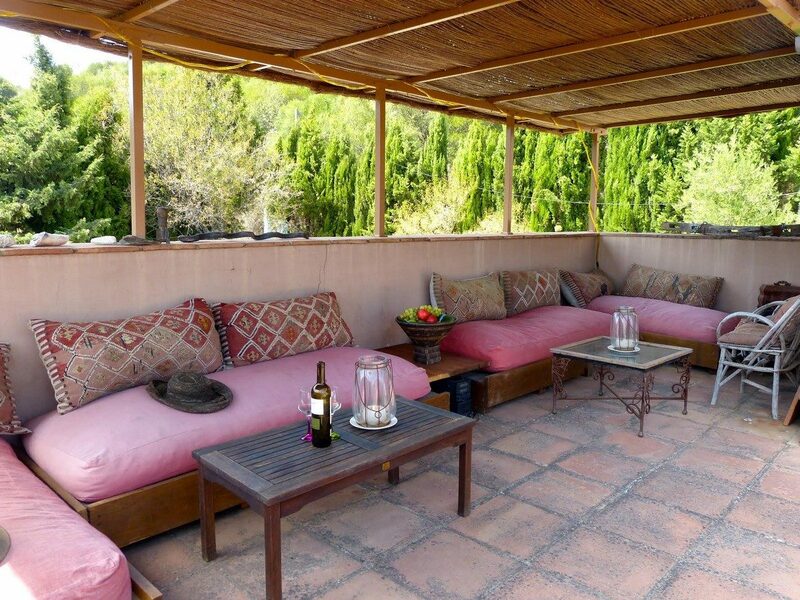 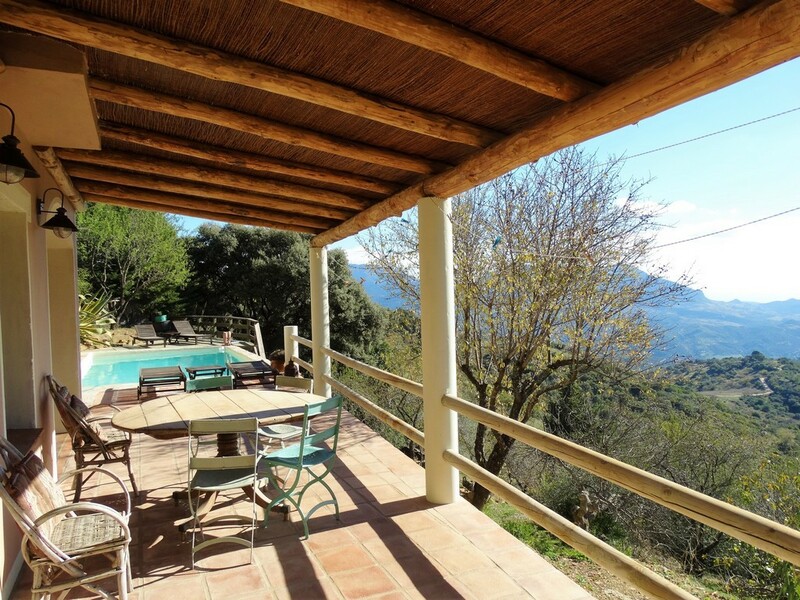 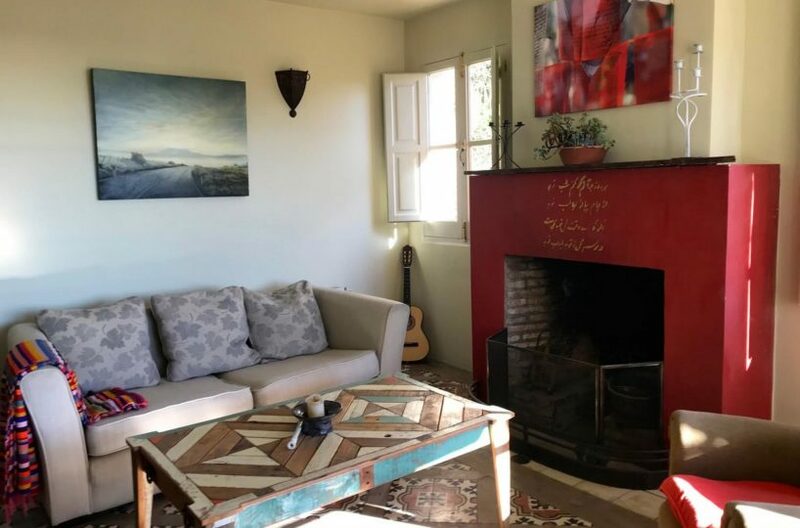 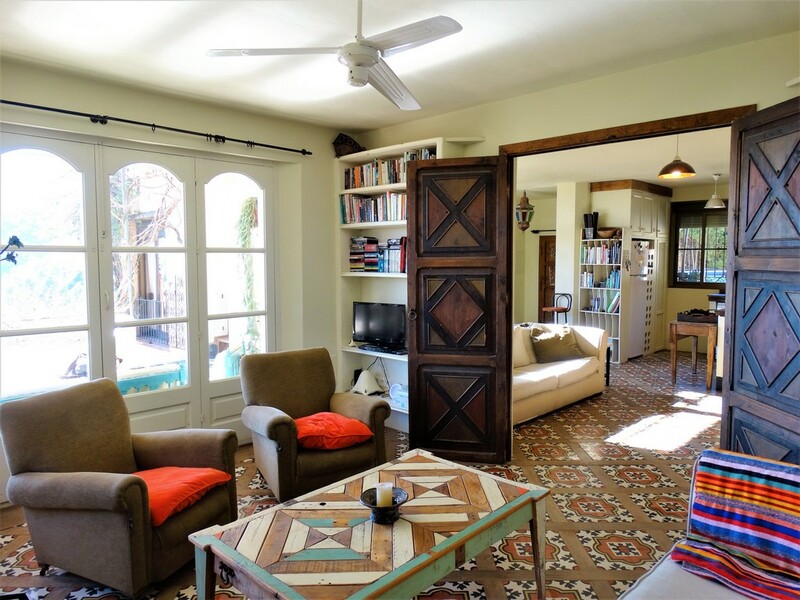 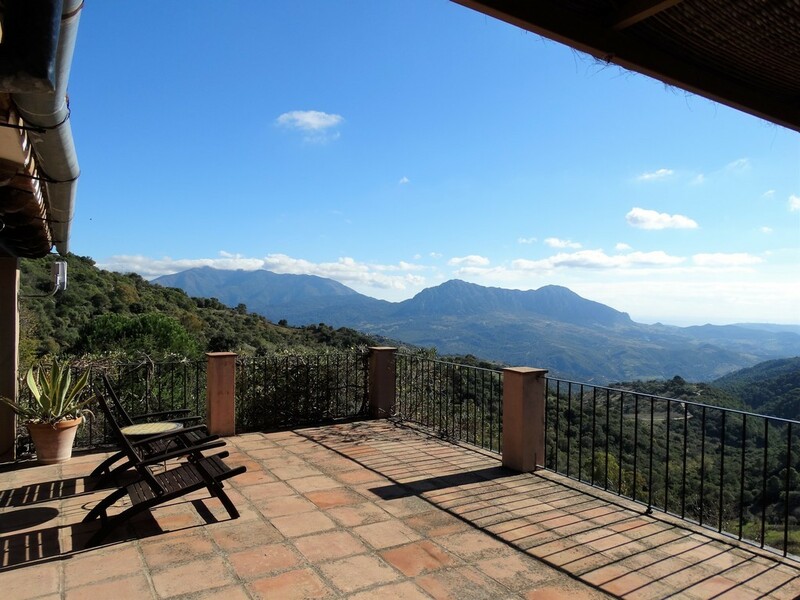 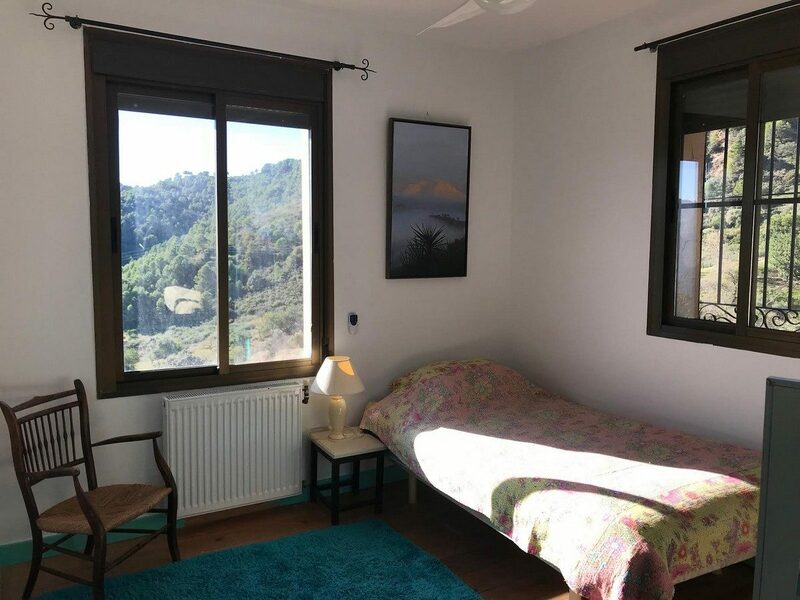 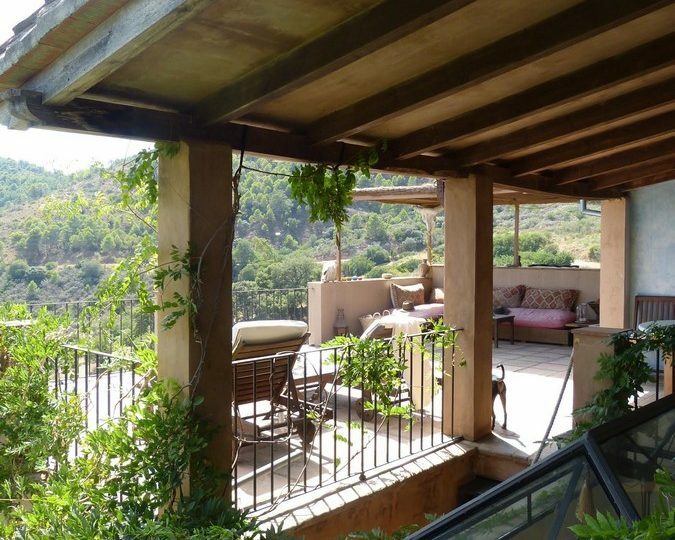 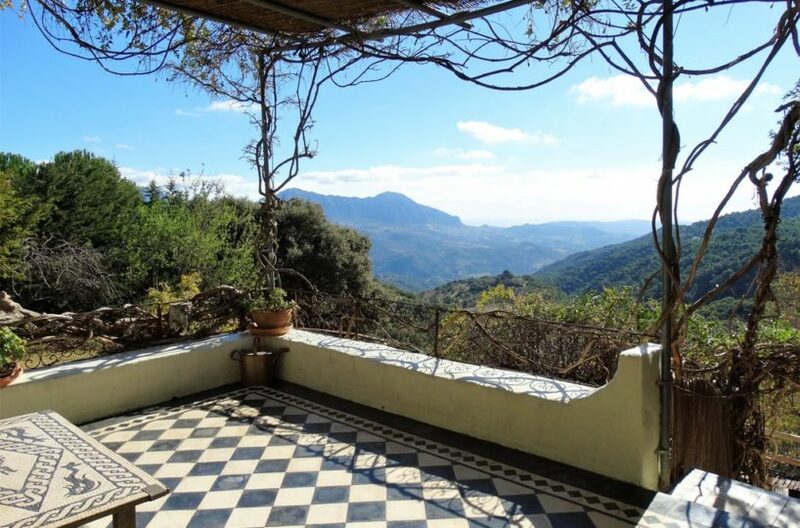 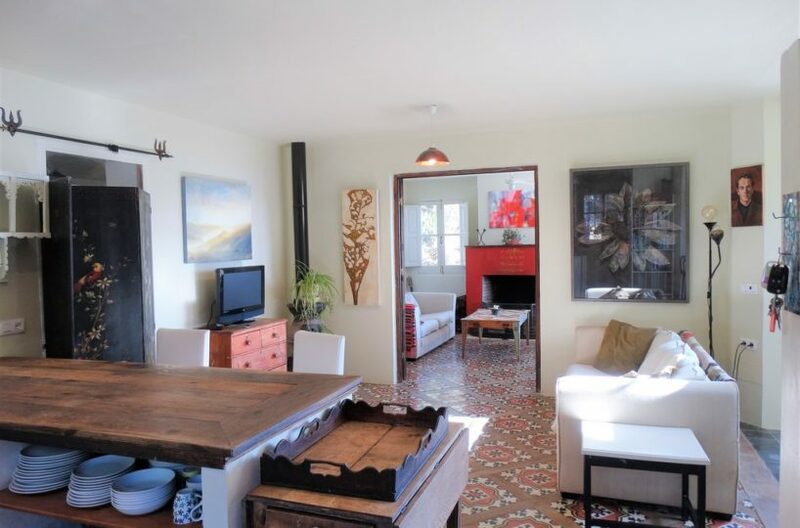 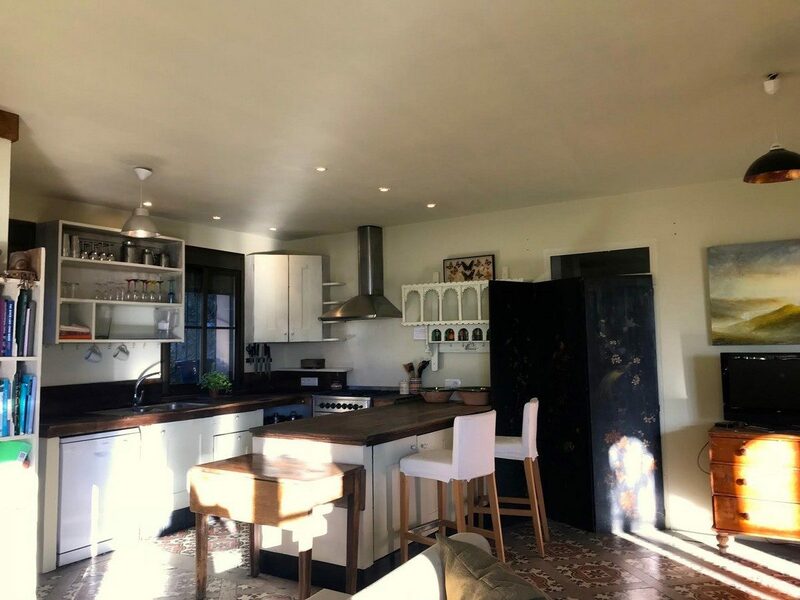 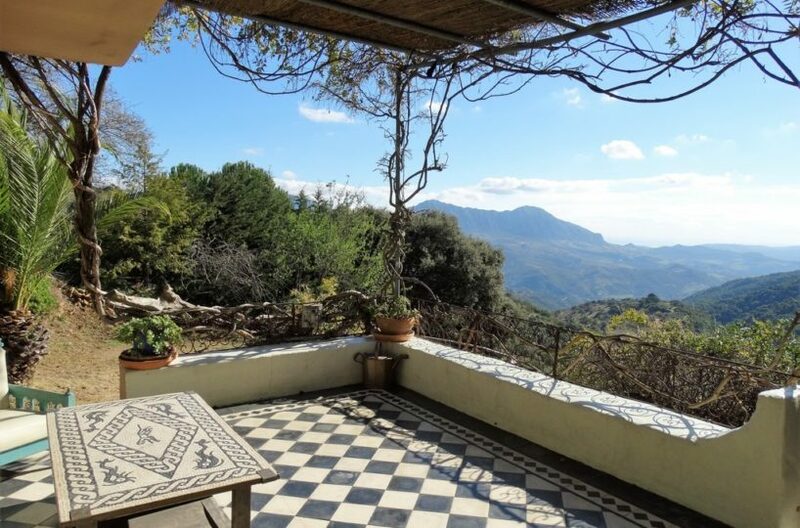 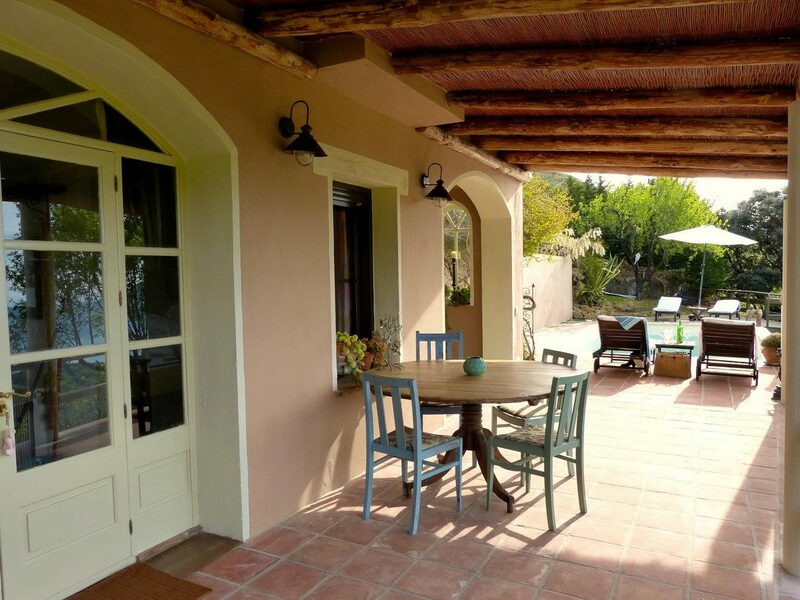 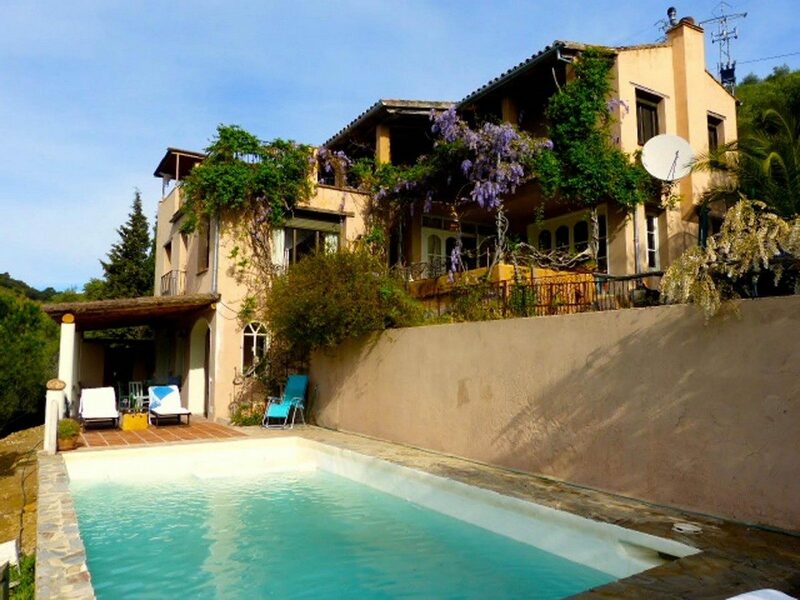 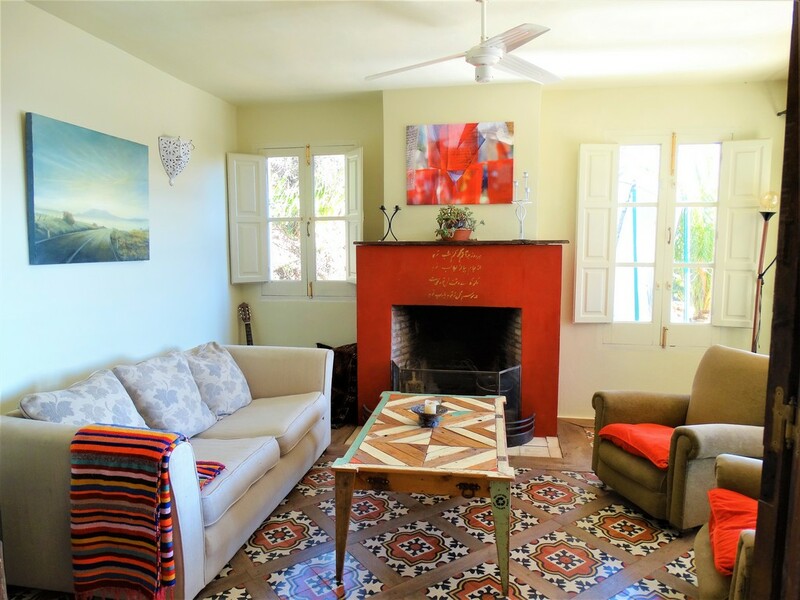 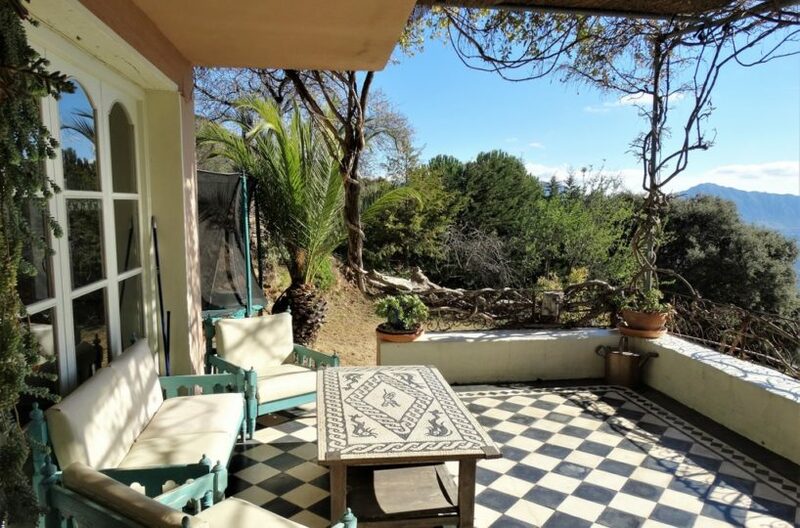 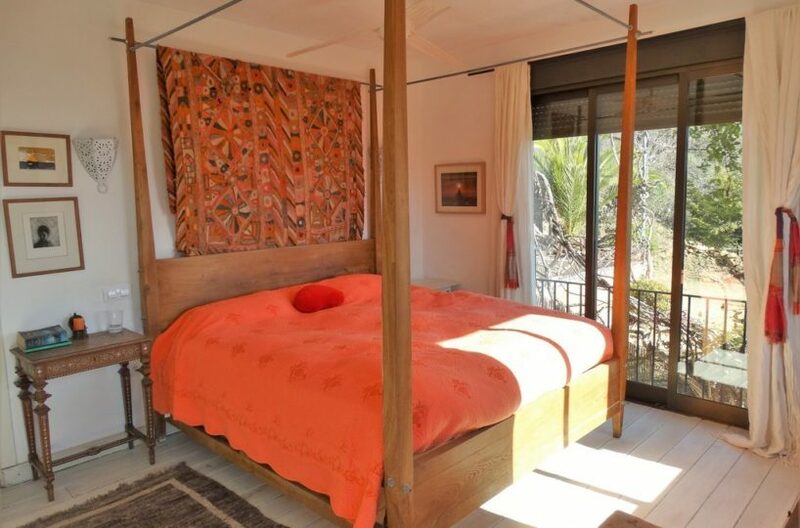 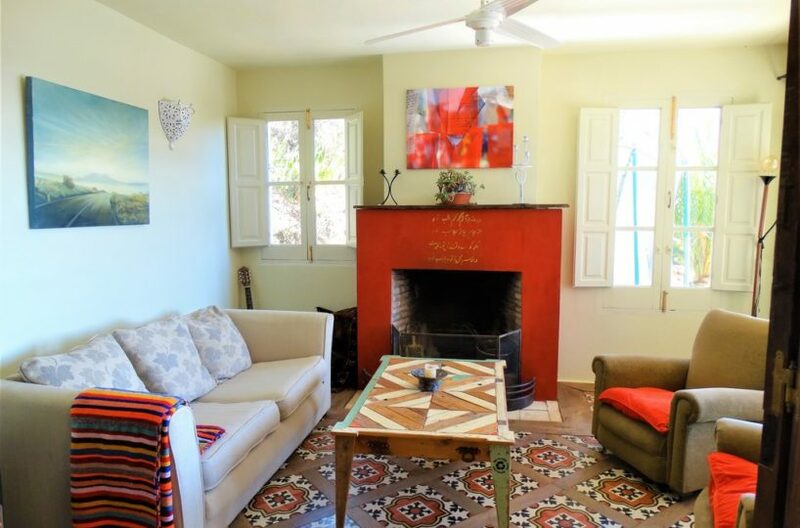 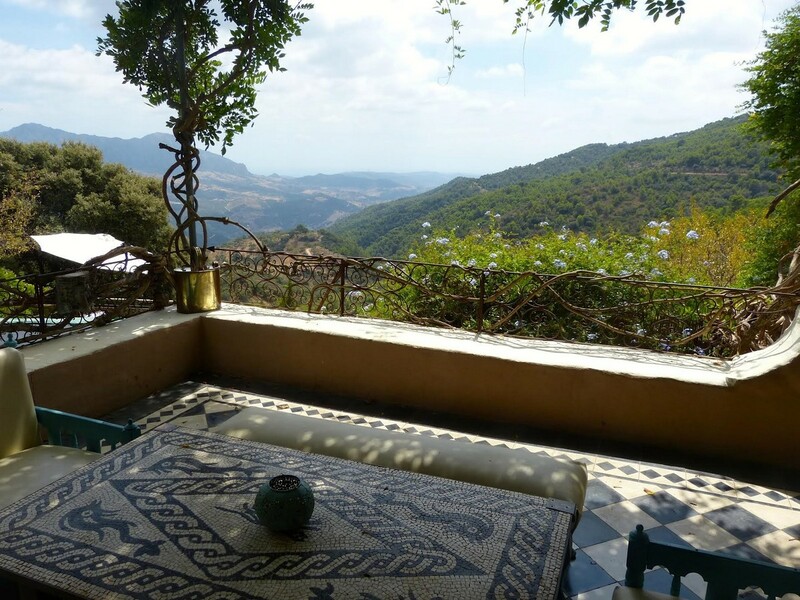 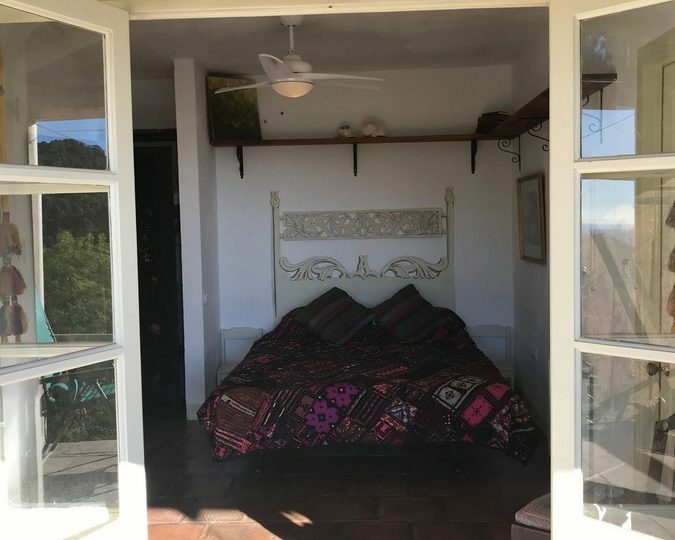 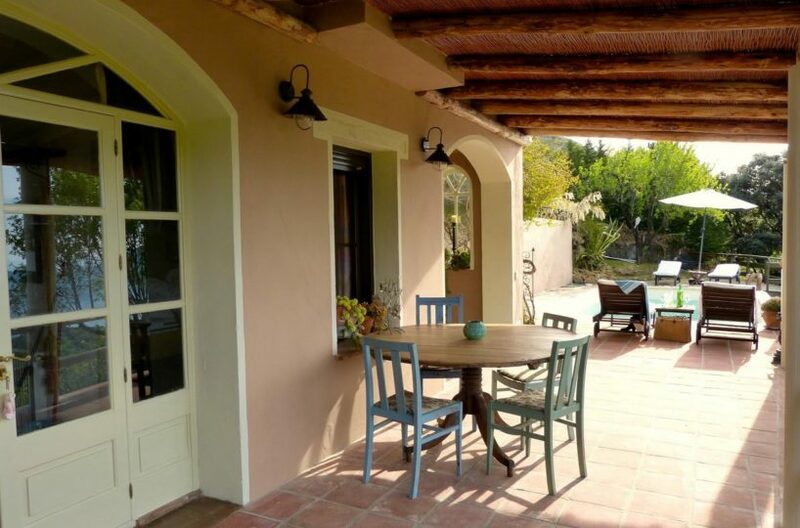 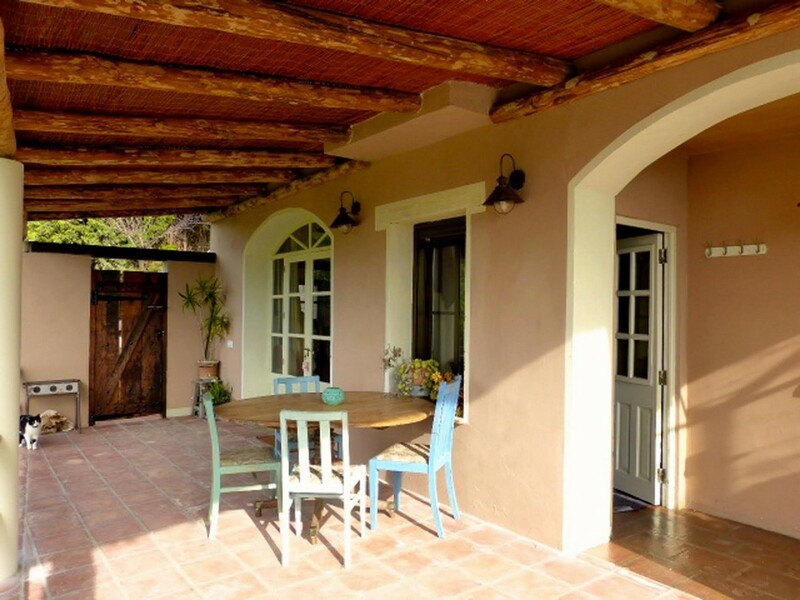 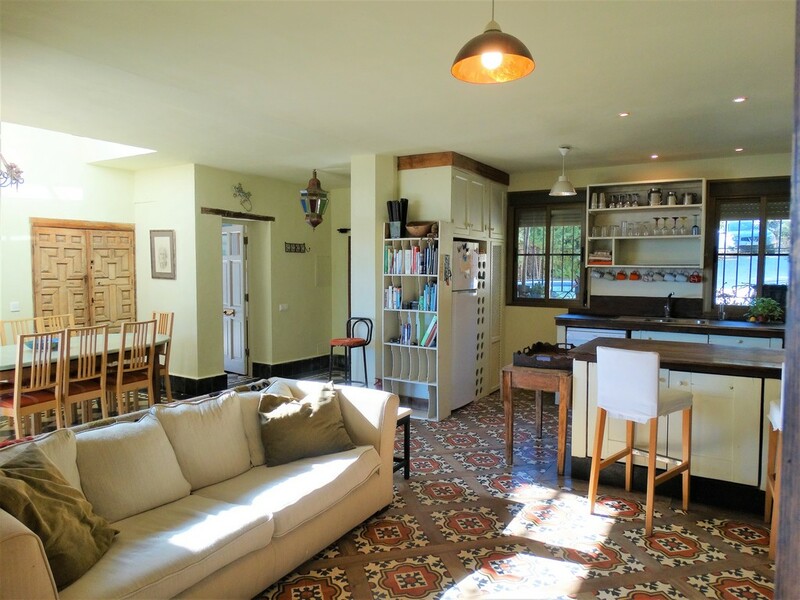 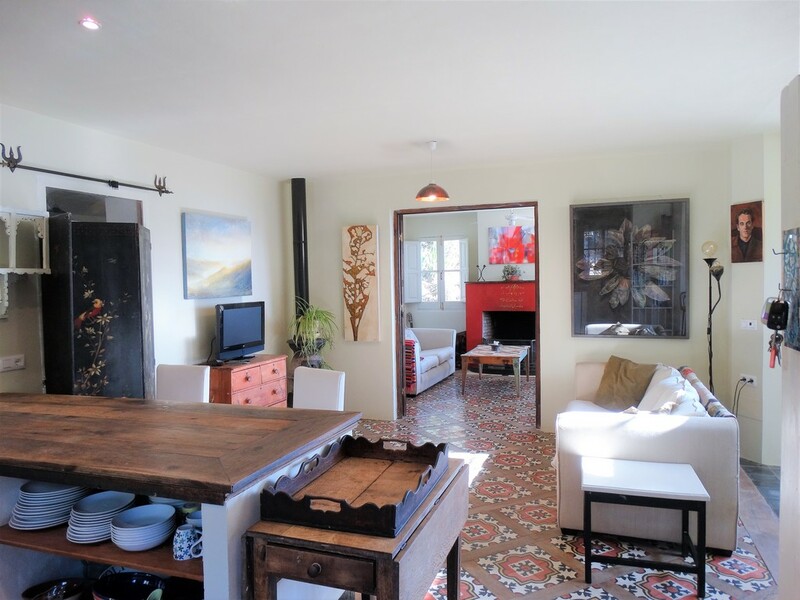 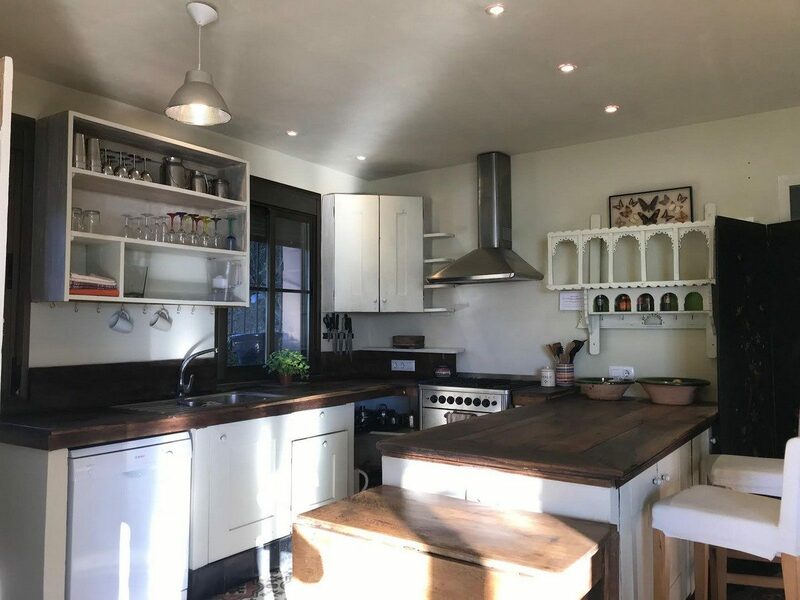 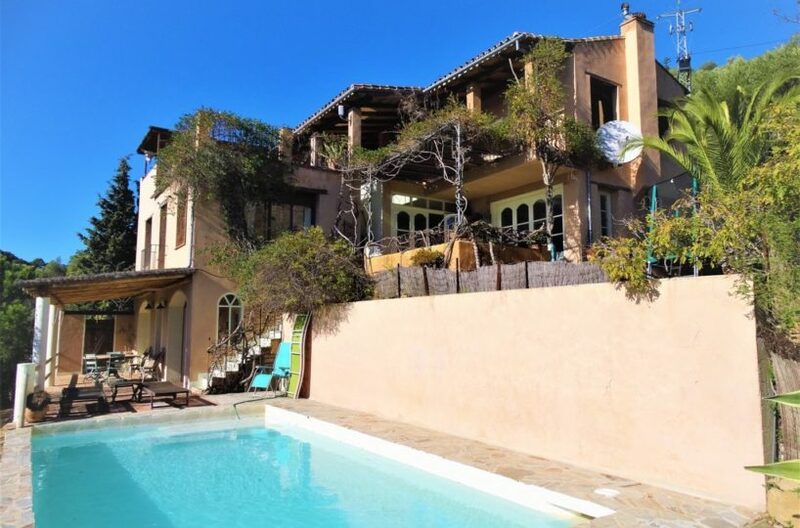 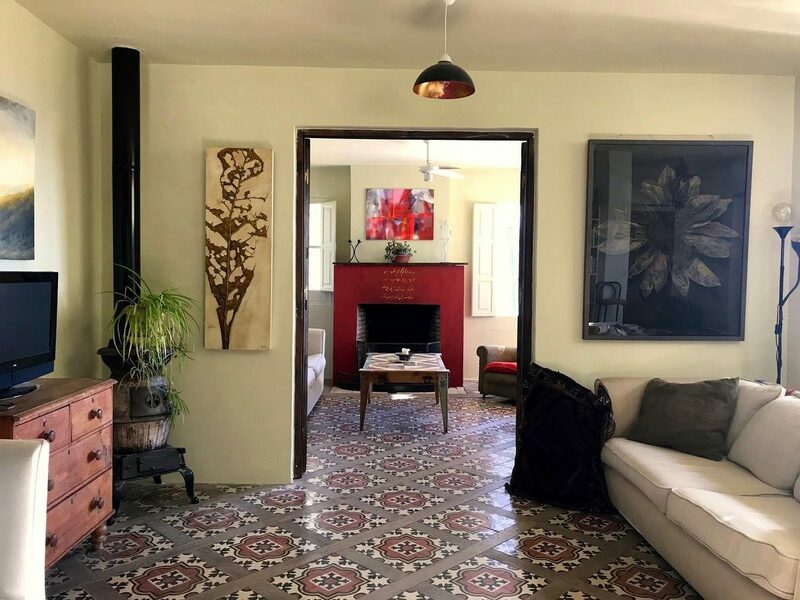 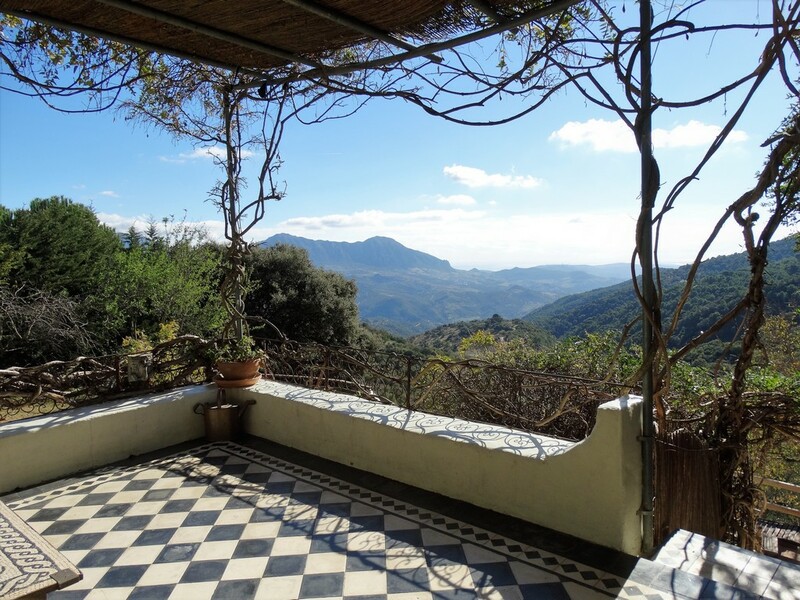 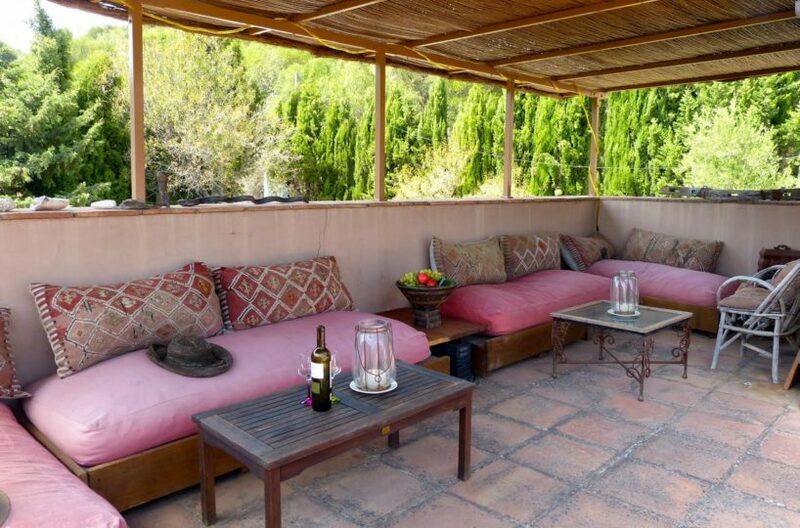 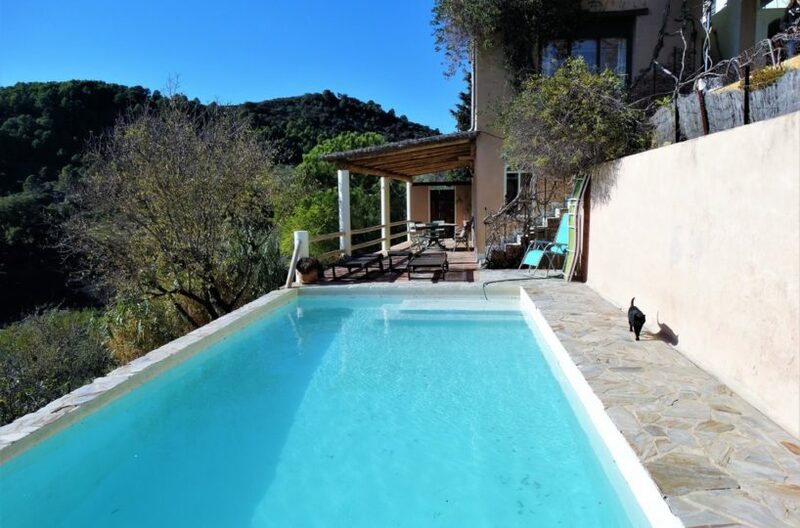 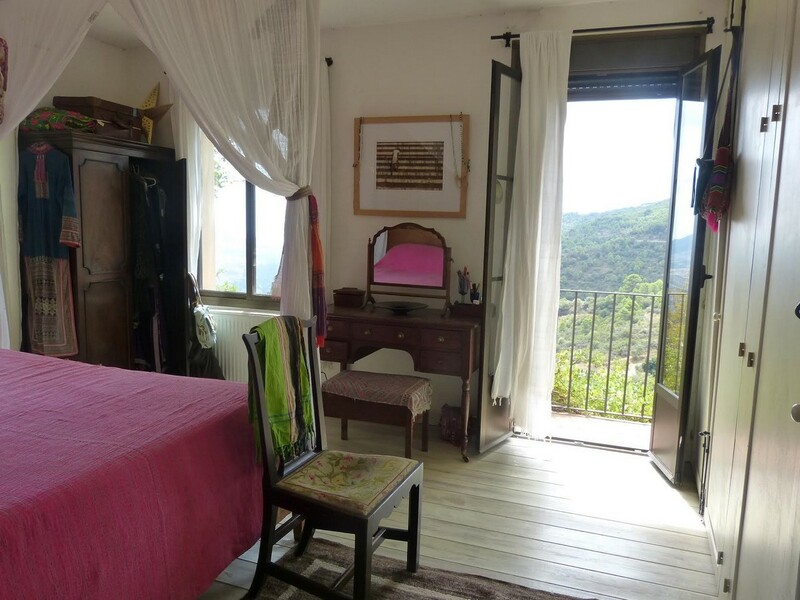 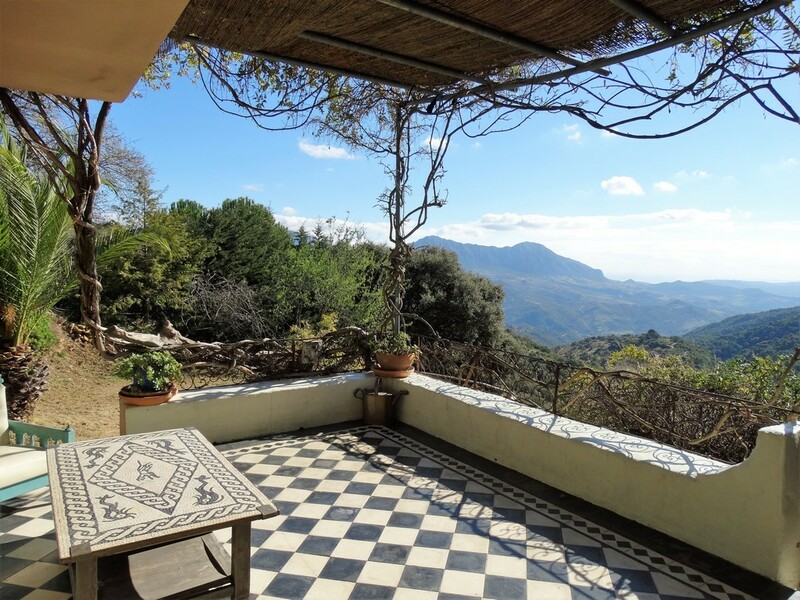 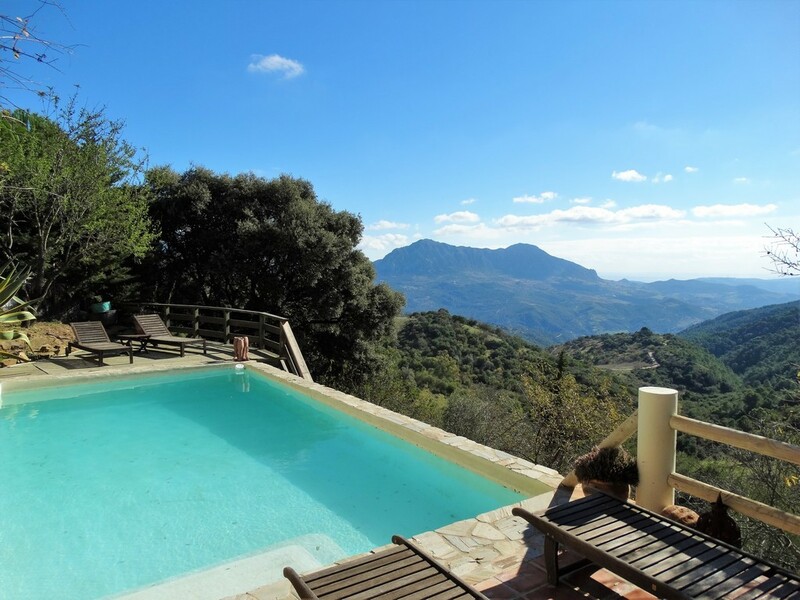 This is a unique property in Gaucin, full of character and rustic charm with potential for three separate guest buildings all with independent access. 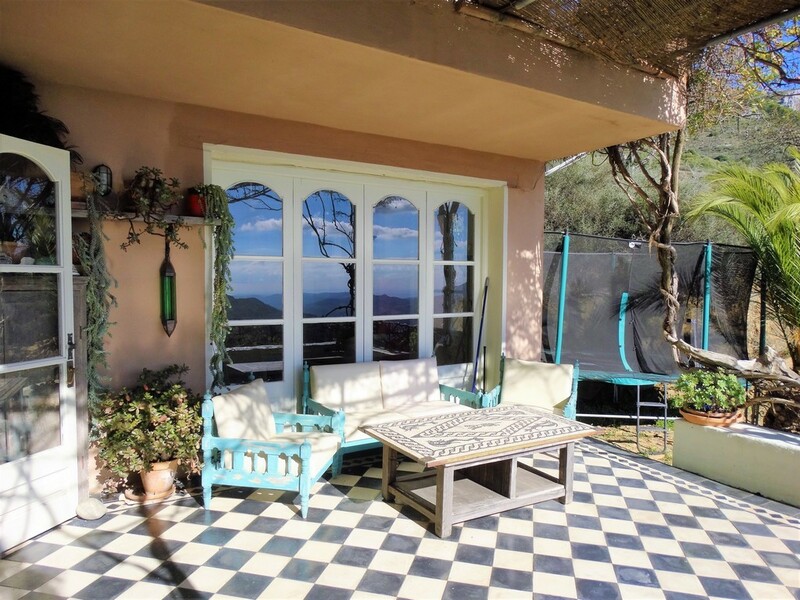 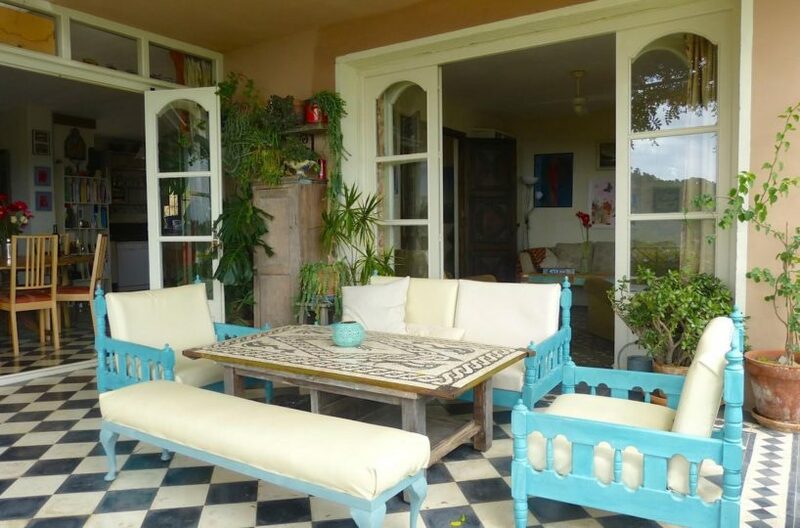 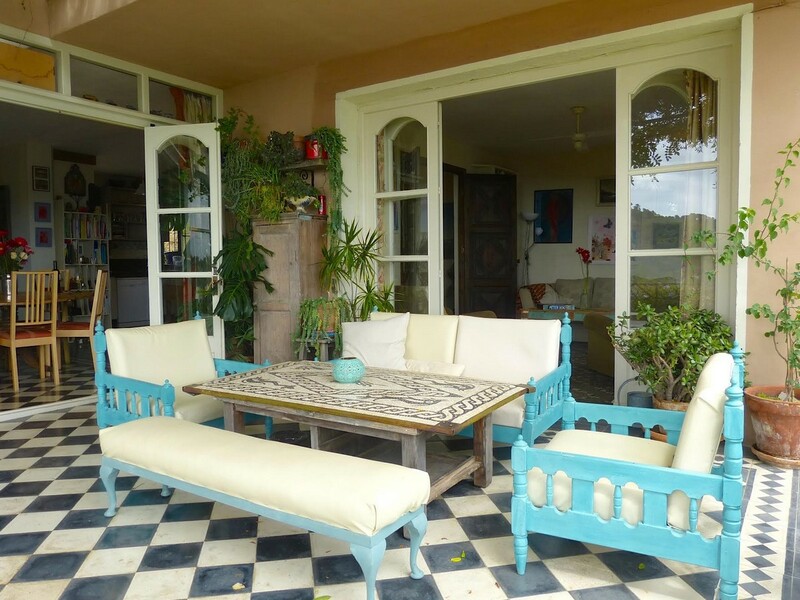 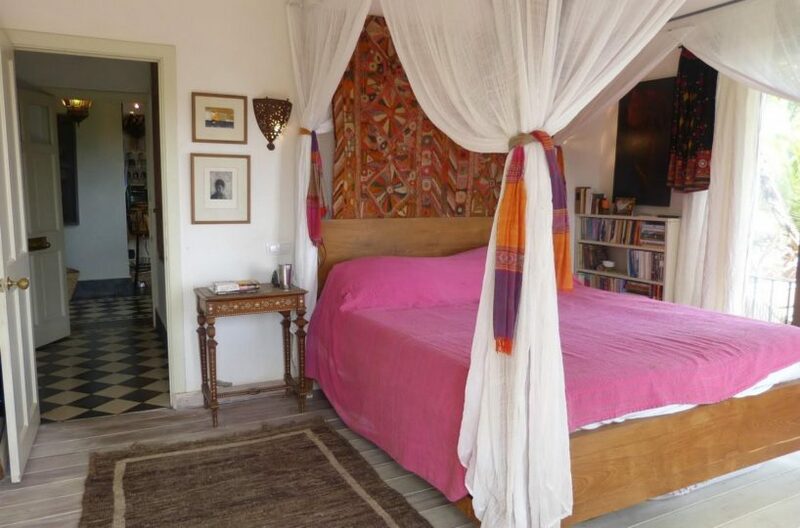 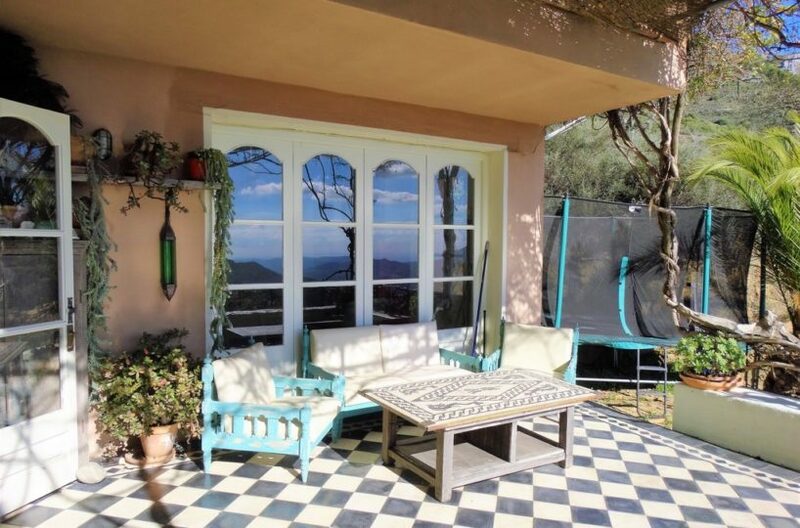 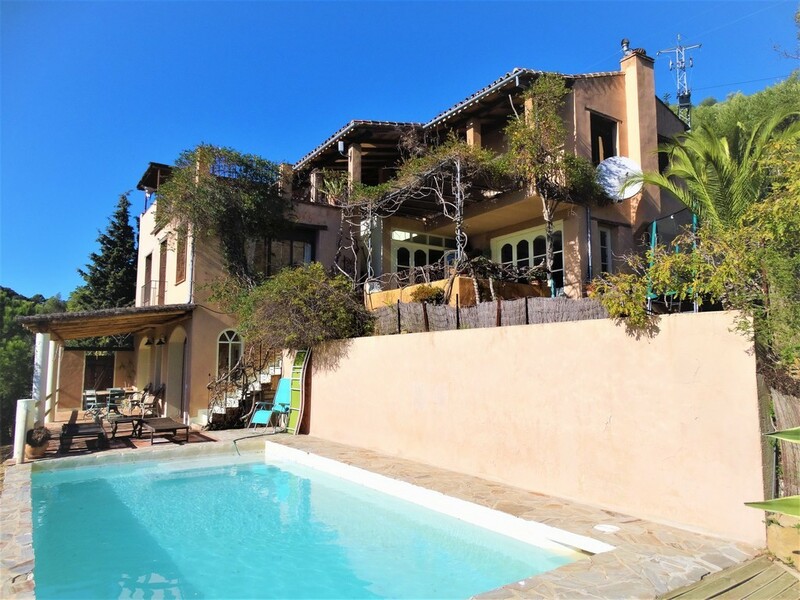 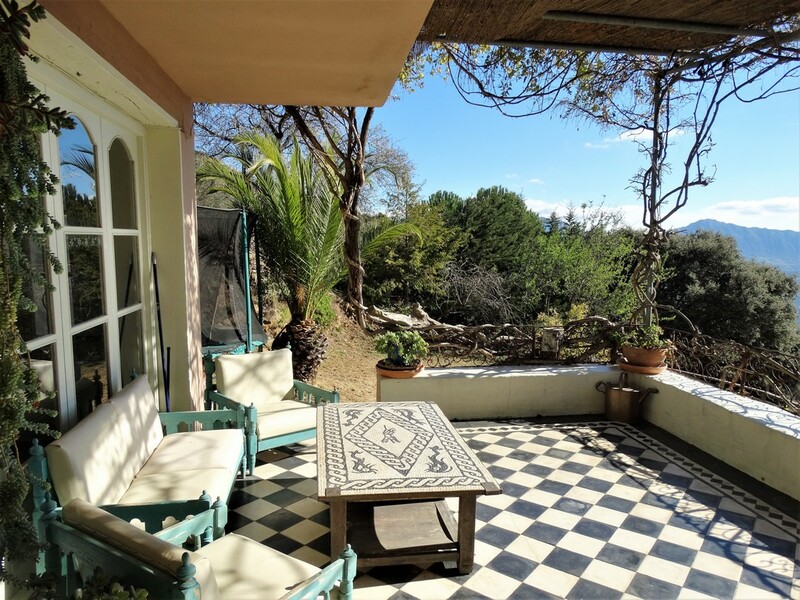 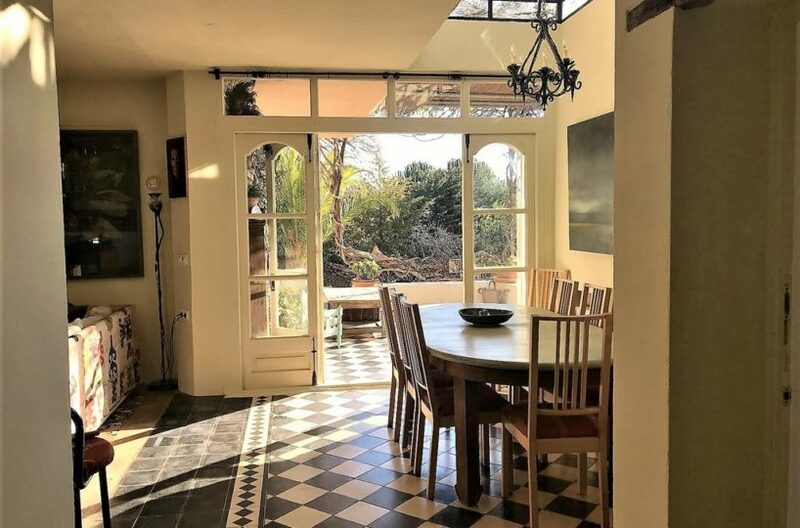 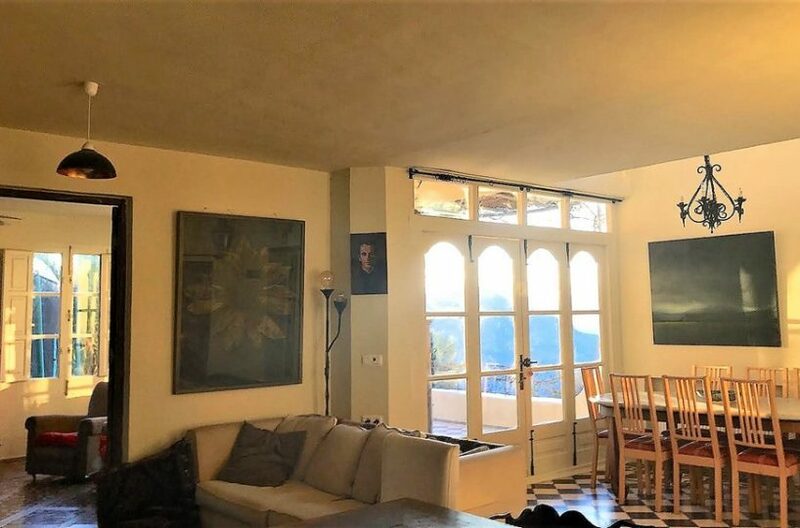 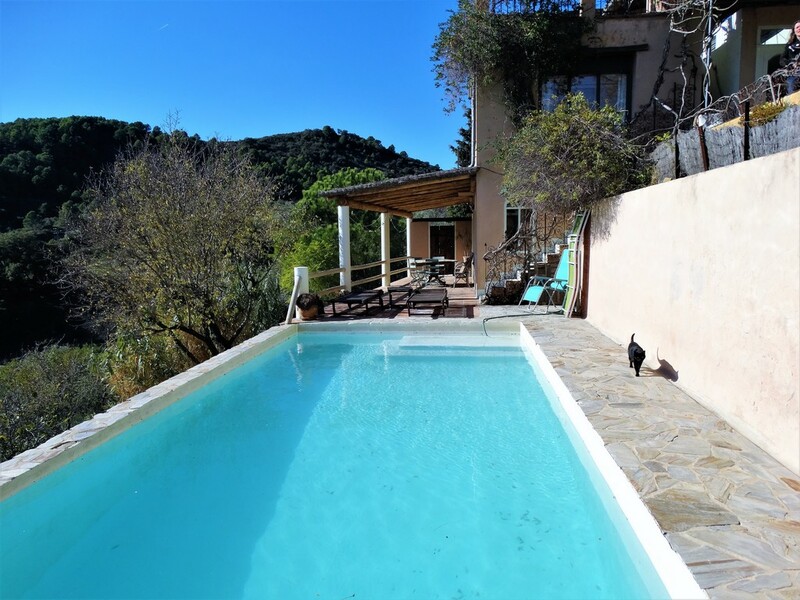 A beautifully designed property in the desirable village of Gaucin within a privileged location and surrounded by the views and countryside for which the area is famed.